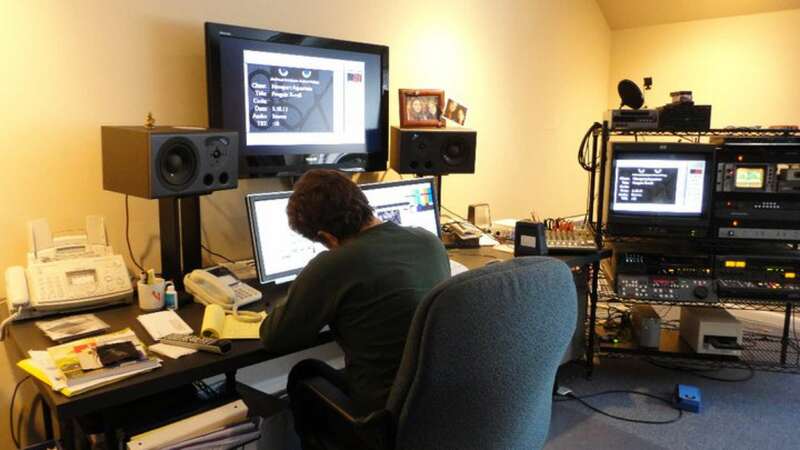 Here’s a peek behind the curtain where all the magic is made. 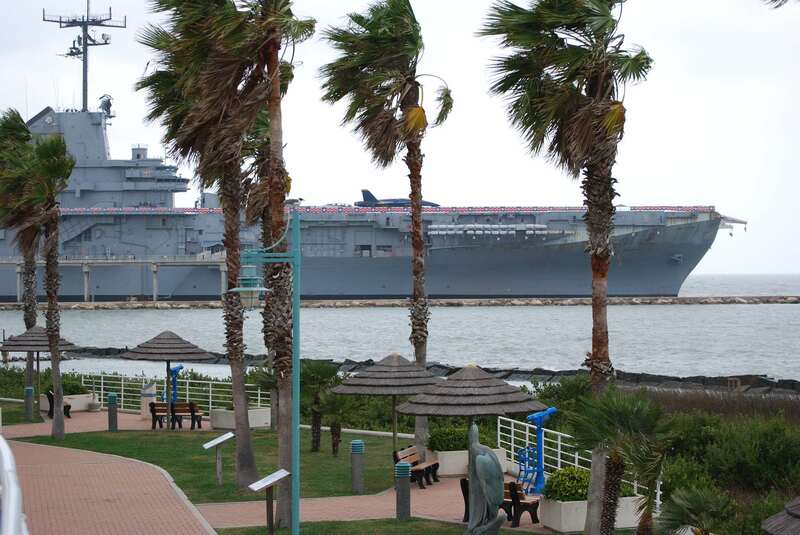 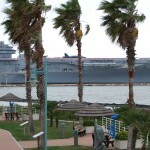 The USS Lexington in Corpus Christie Bay. 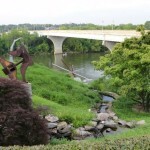 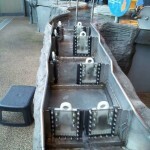 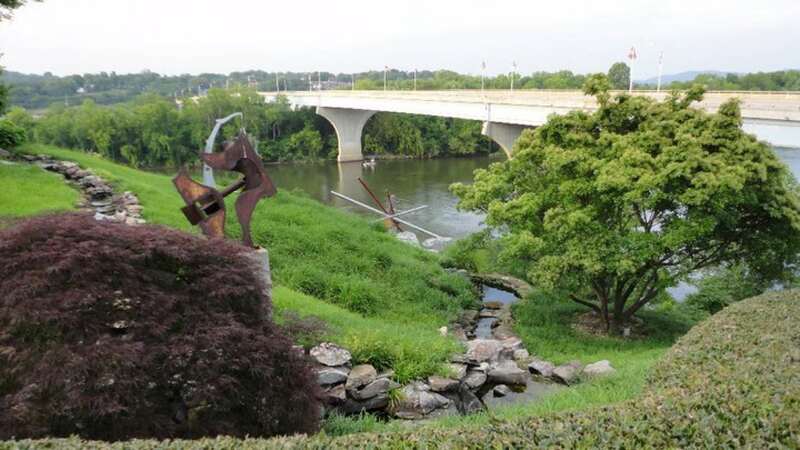 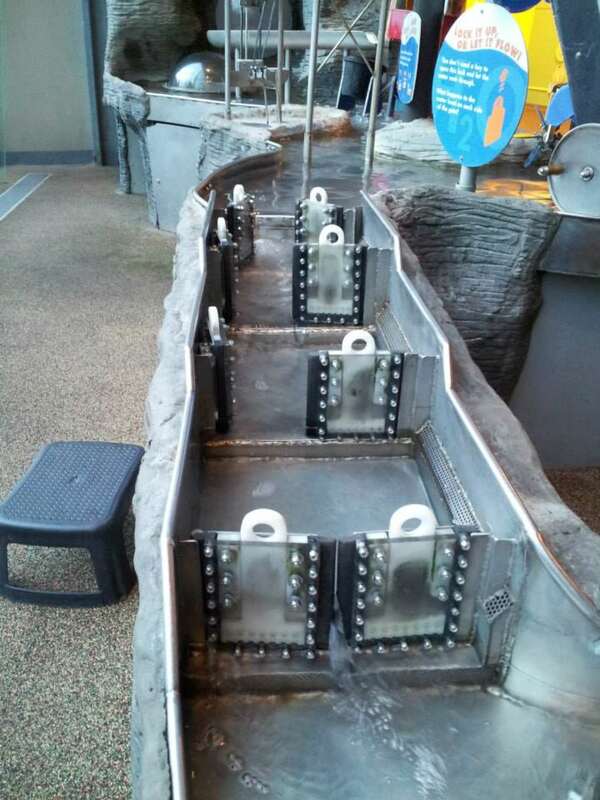 “Riverplay” exhibit at Creative Discovery Museum. 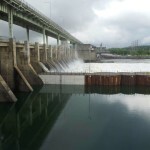 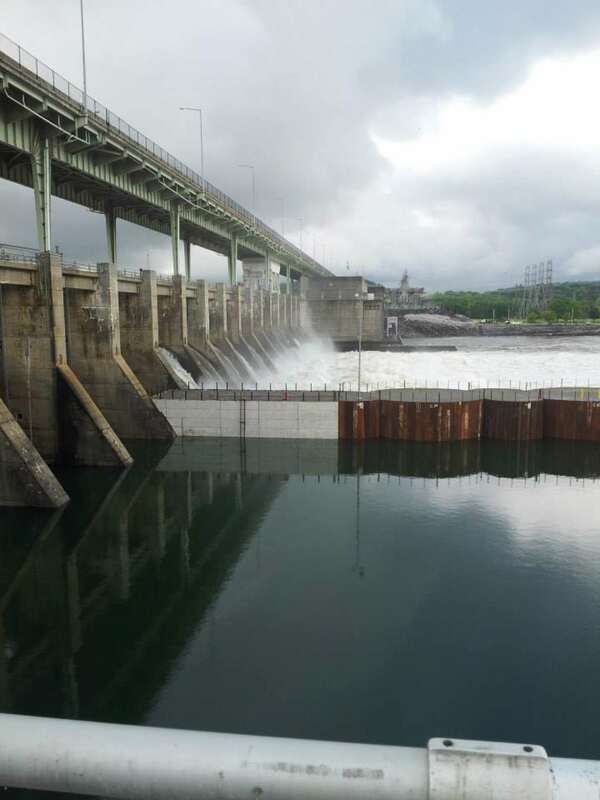 Chickamauga Dam on the Tennessee River. 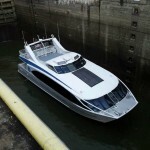 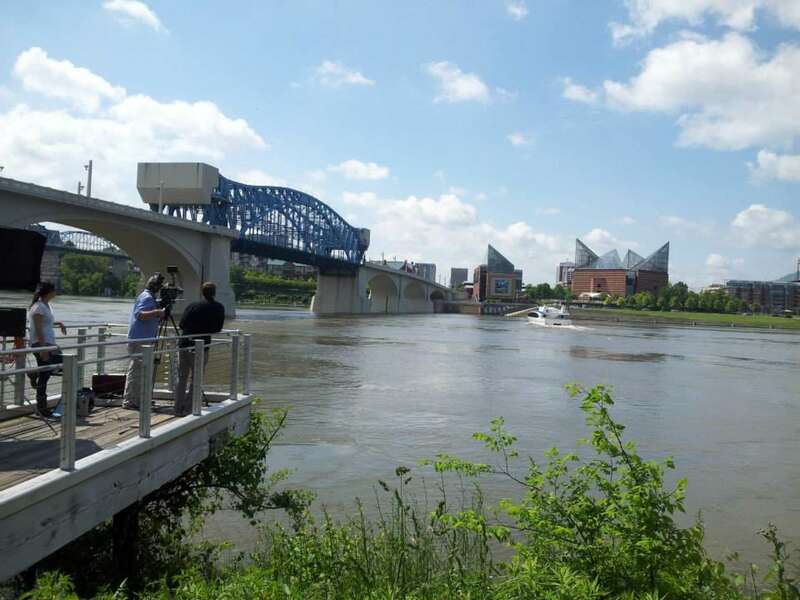 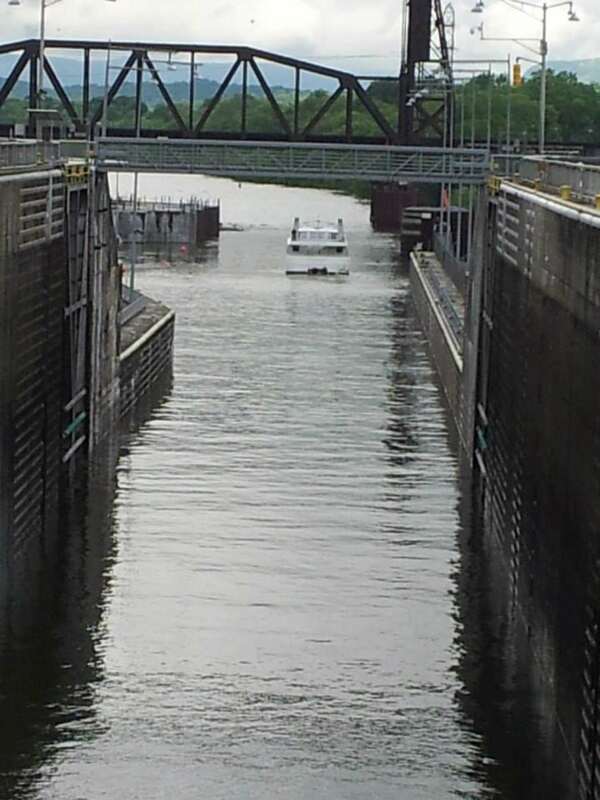 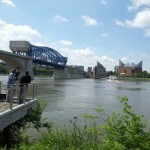 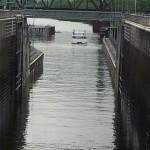 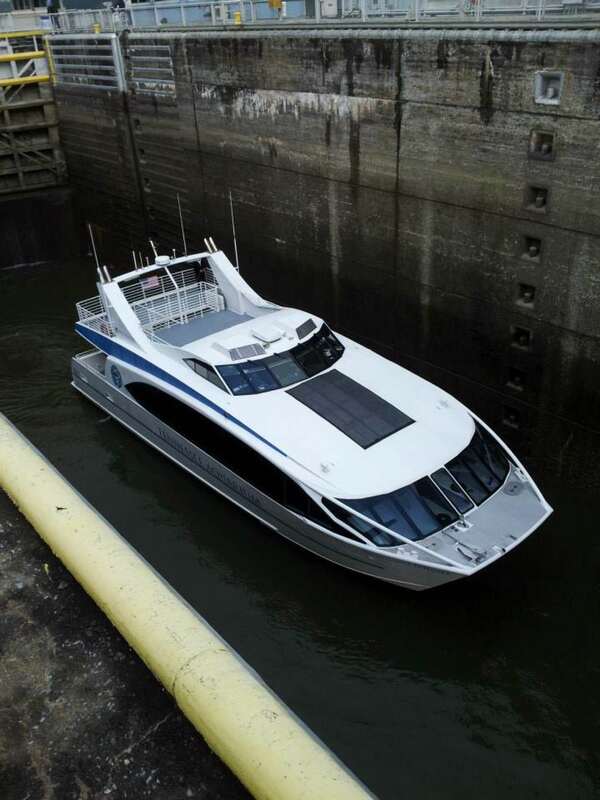 Tennessee Aquarium’s Riverboat Explorer navigates the lock. 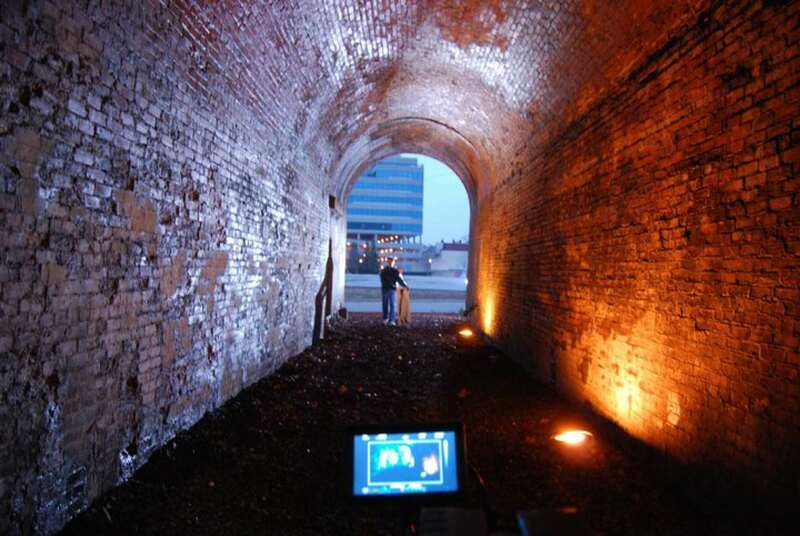 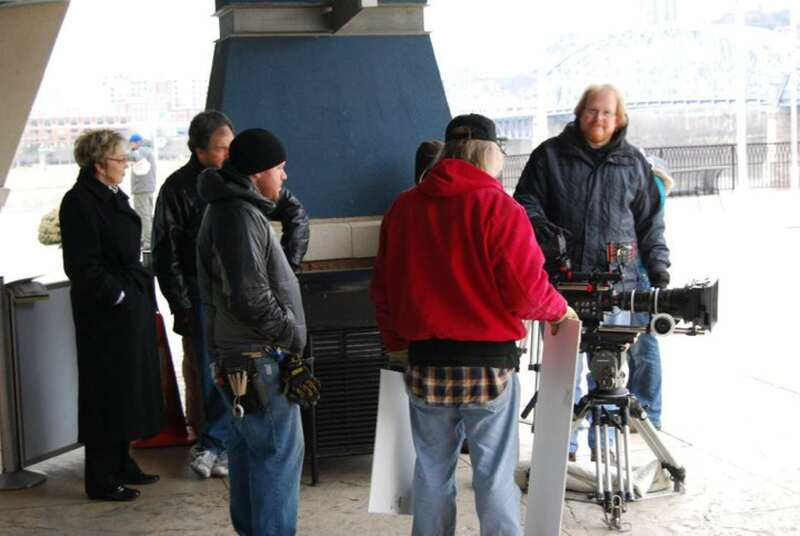 Dave Lang from Atomic Films sets up a shot. 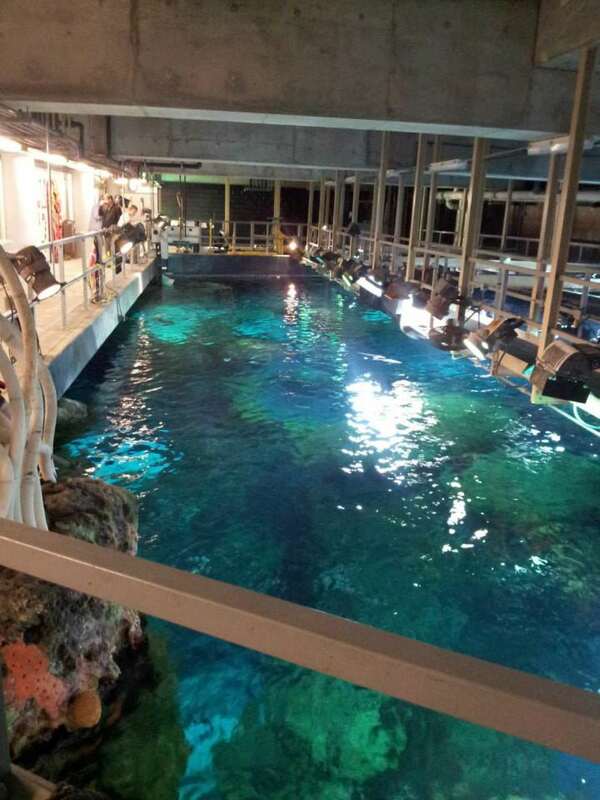 Topside at Secret Reef tank. 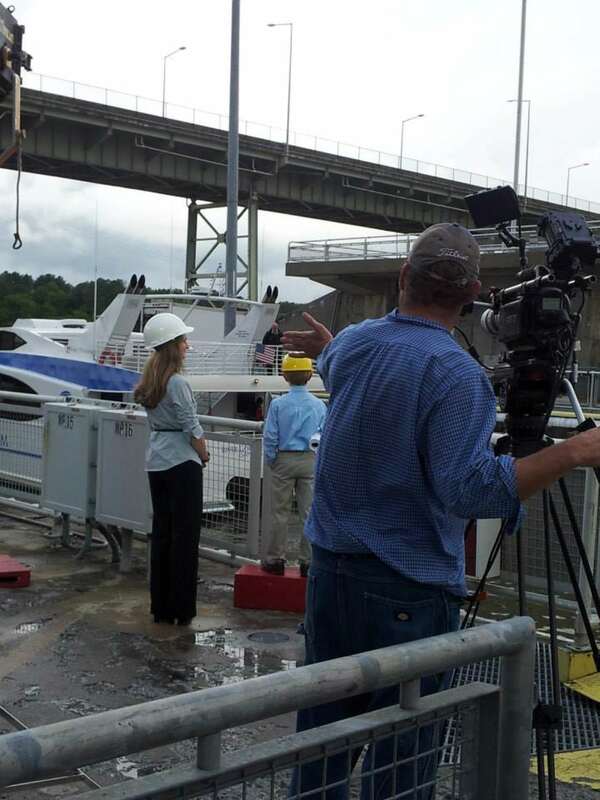 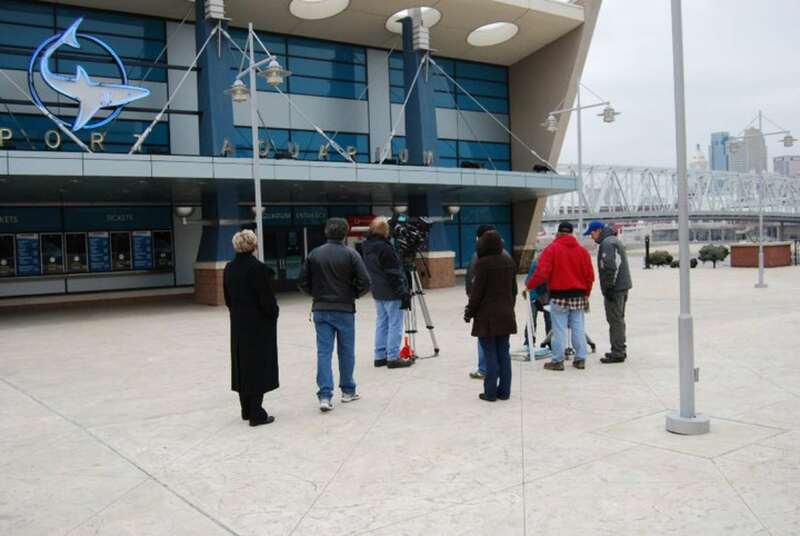 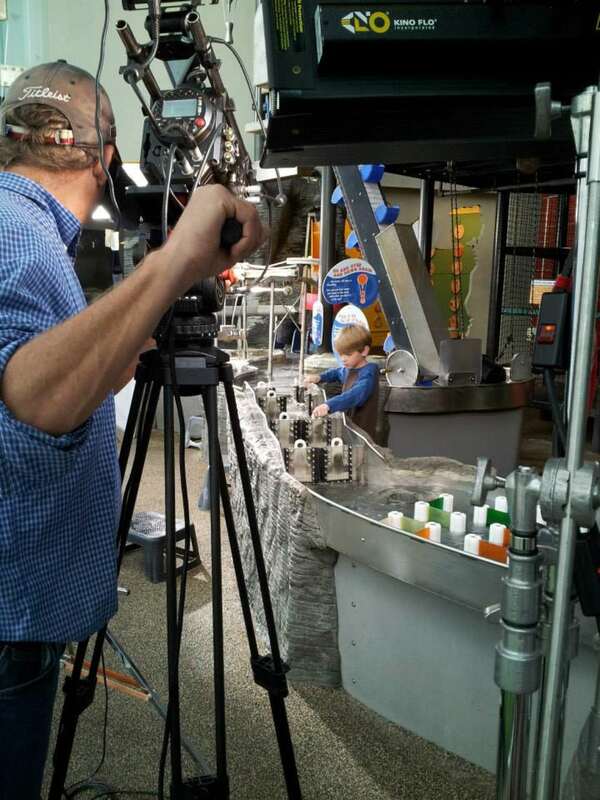 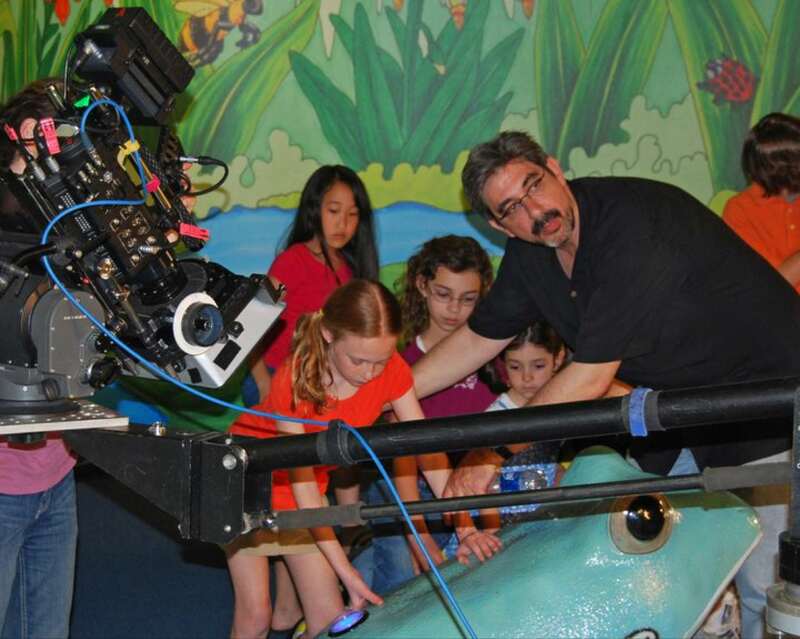 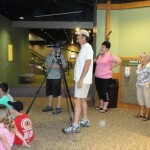 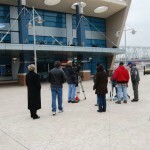 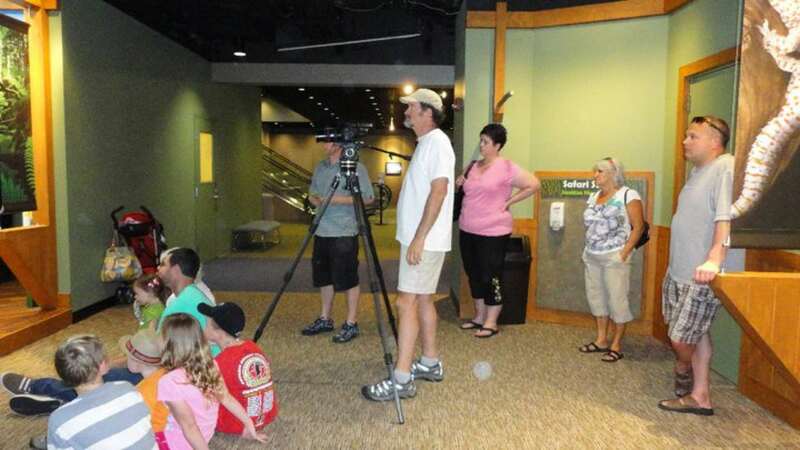 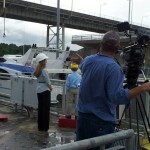 Directing Tennessee Aquarium’s Riverboat Explorer into position. 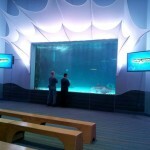 The glass “peaks” of Tennessee Aquarium. 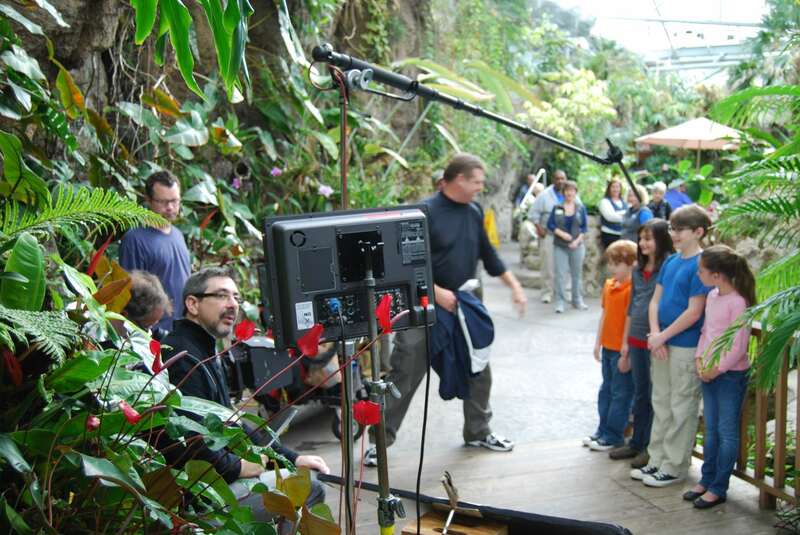 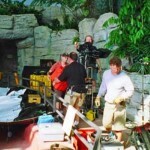 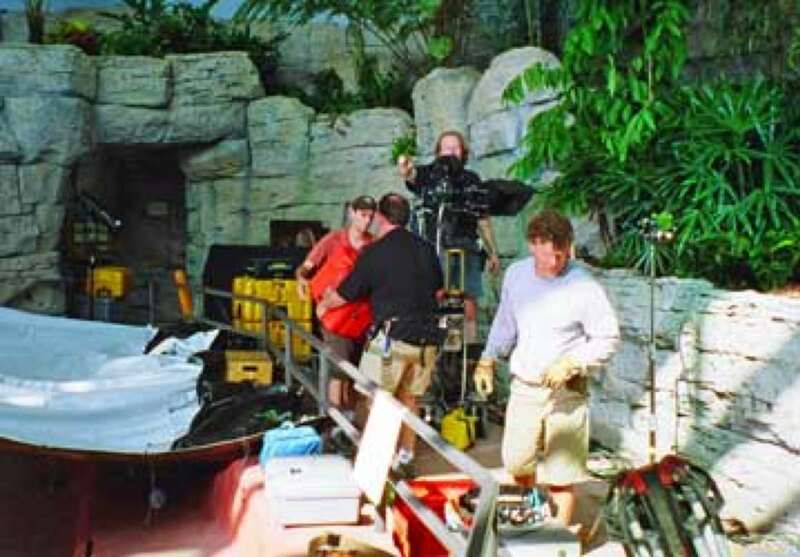 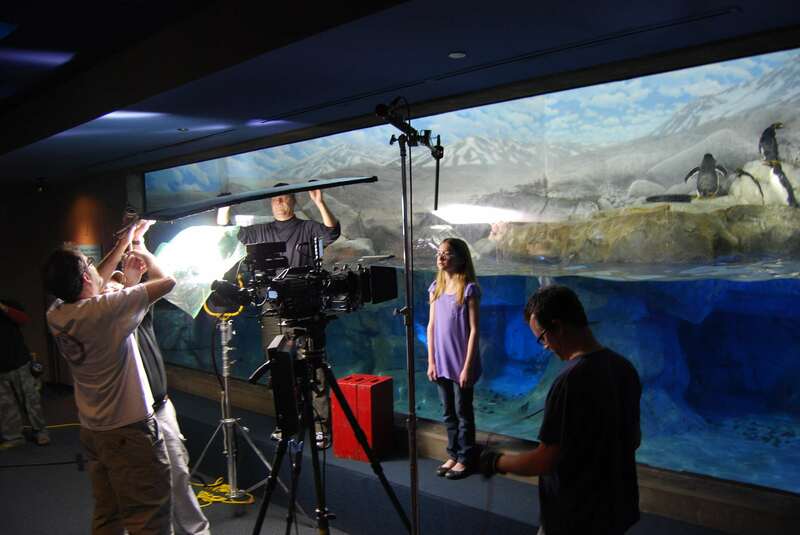 Prepping set at Rainforest exhibit. 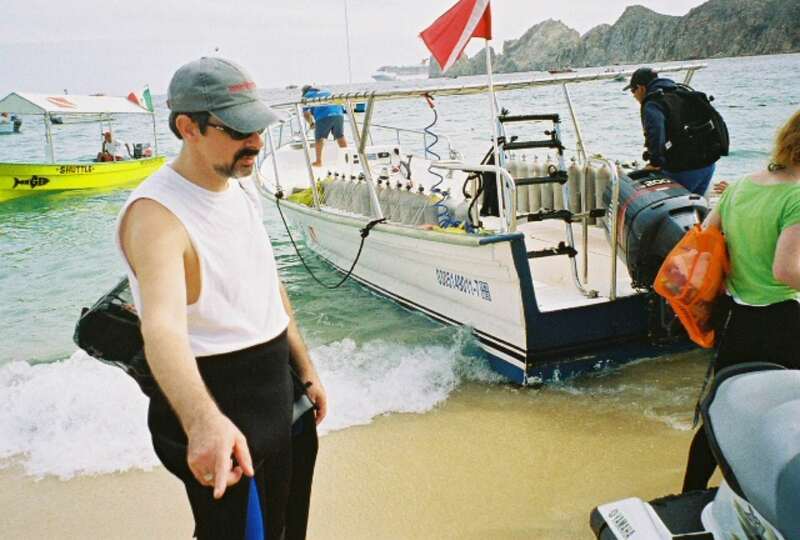 Prepping to scout sea lions off coast of Cabo San Lucas. 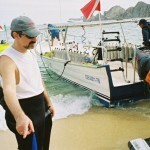 Sea of Cortez dive with sea lions. 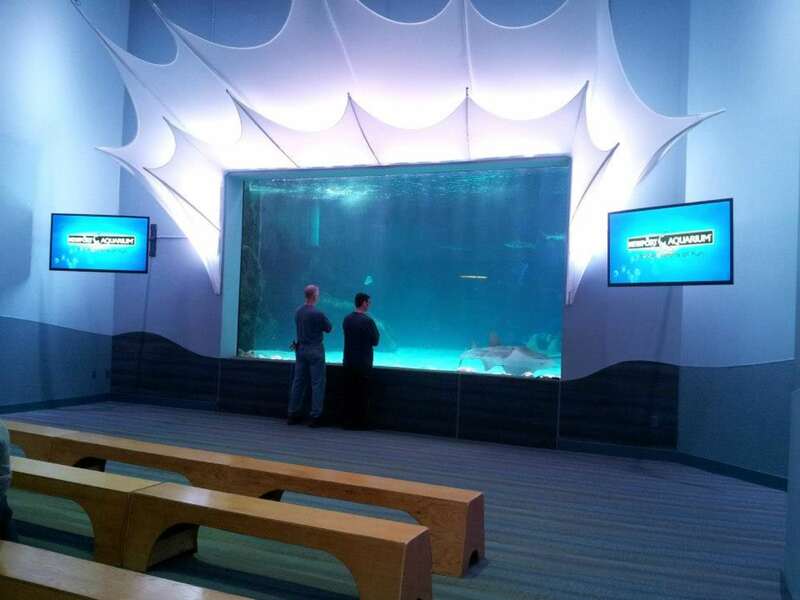 Shark Ray Bay Theater at Newport Aquarium. 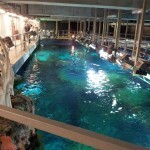 Dive deck at Newport Aquarium. 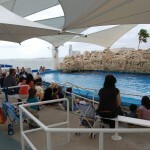 Dolphin Bay at Texas State Aquarium. 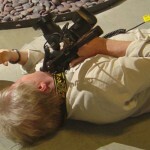 Atomic Films’ Dave Lang preps camera. 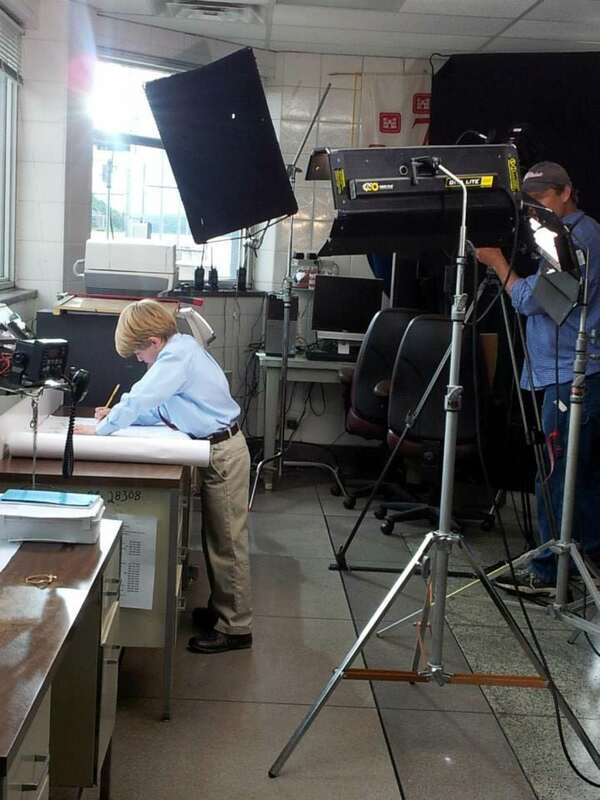 “Engineer” Lane in Chickamagua Dam’s control room. 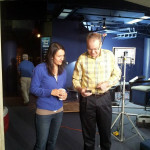 Anna and Zach find their marks. 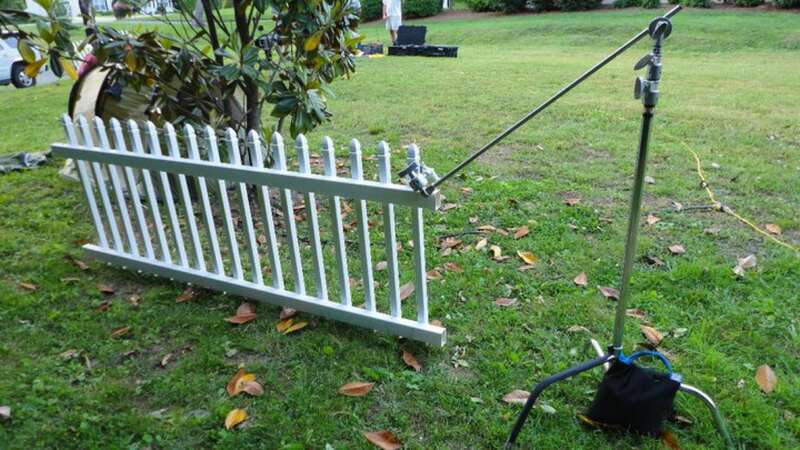 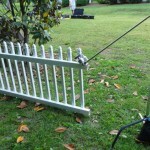 Makeshift fence for “Ranger Rick’s Backyard Safari” spot. 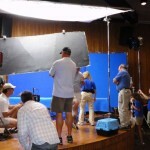 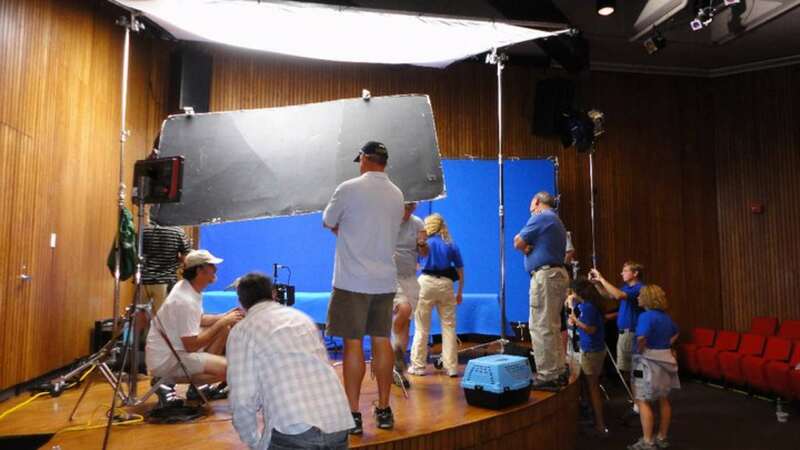 Setting up the blue screen. 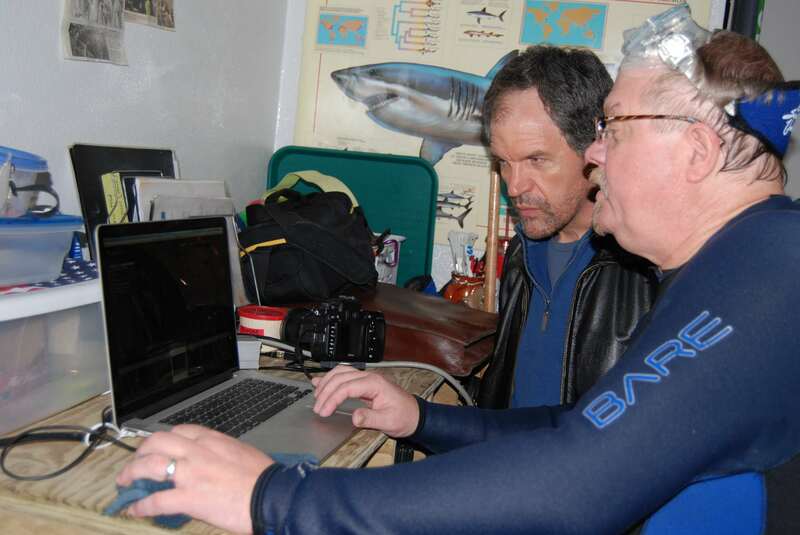 Dennis Rutherford and Mark Alexander reviewing shots. 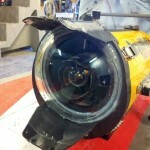 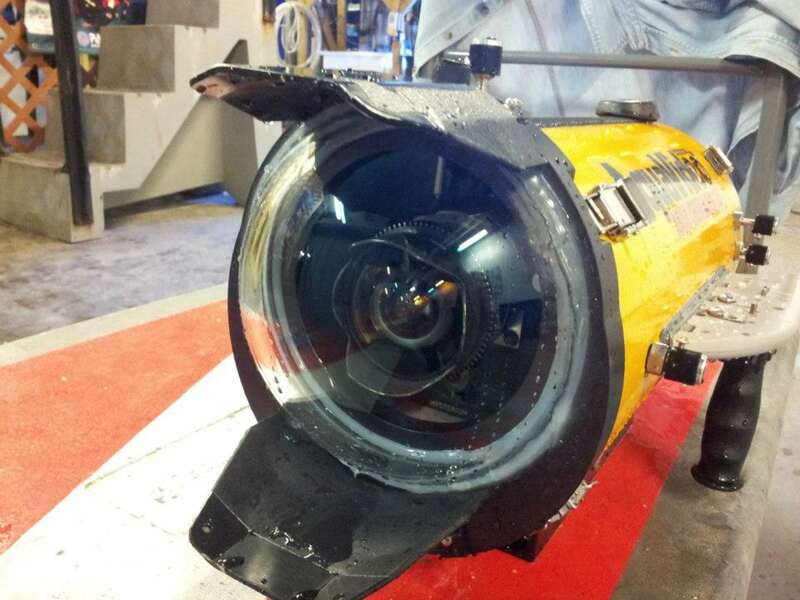 RED Epic camera locked and loaded in underwater housing. 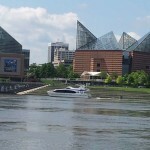 Chasing sundown in downtown Chattanooga. 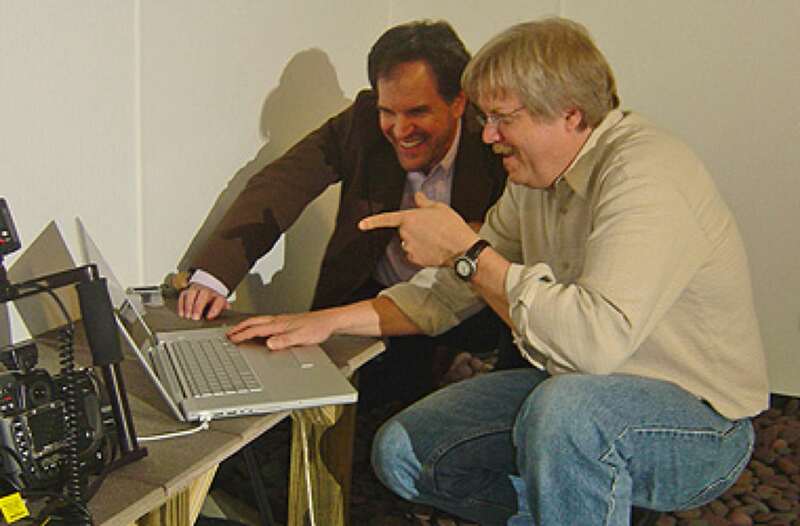 Mark Alexander and Dennis Rutherford. 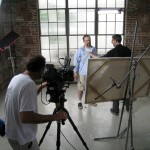 Shirt #9 during “The Artist” shoot. 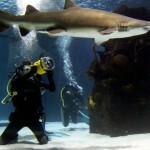 Dave Theis and Rosie the Sand Tiger Shark. 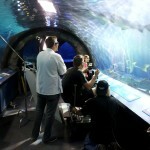 Dave Theis chasing sharks with the RED camera in underwater housing. 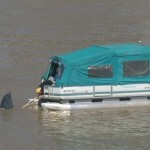 Towing and shooting a fake shark fin in the Ohio River. 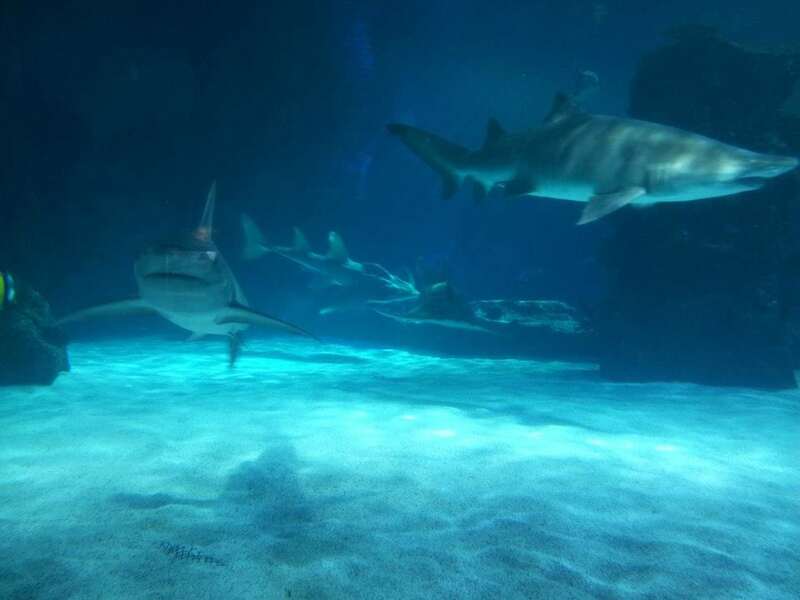 Shark fin was flown in from Hollywood. 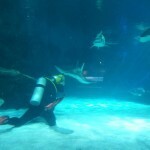 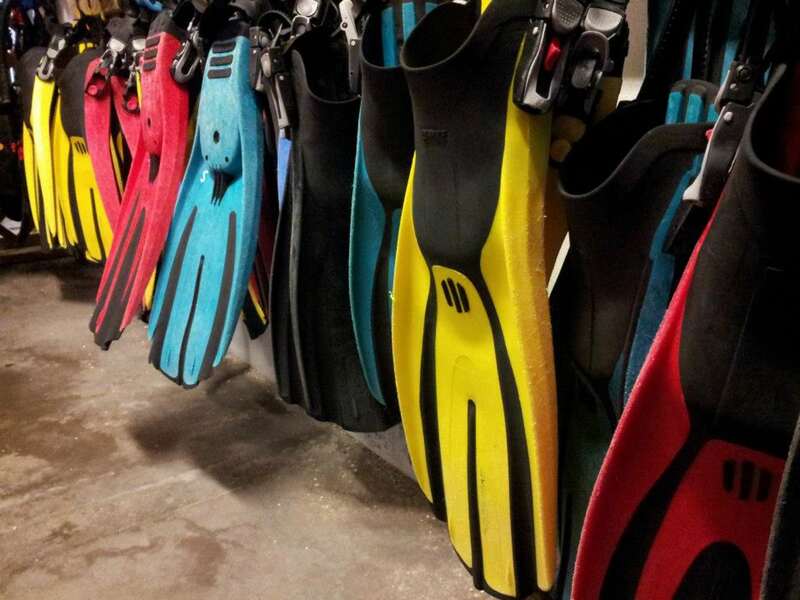 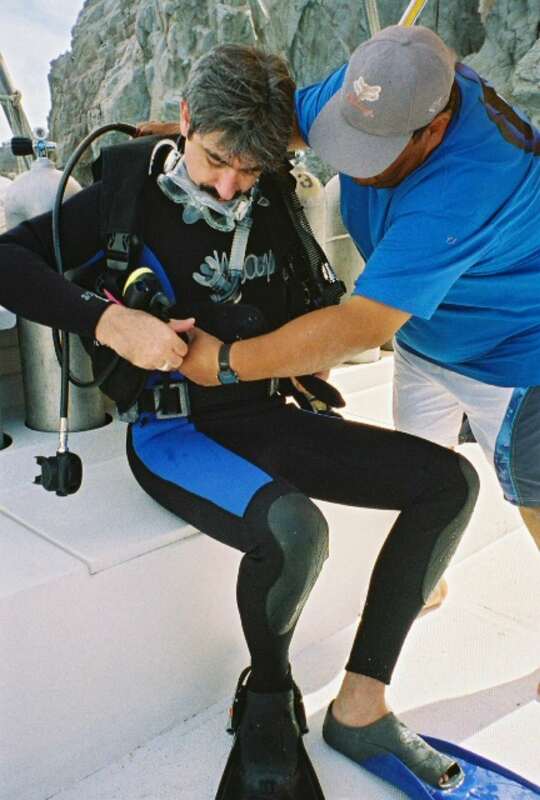 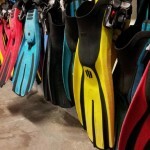 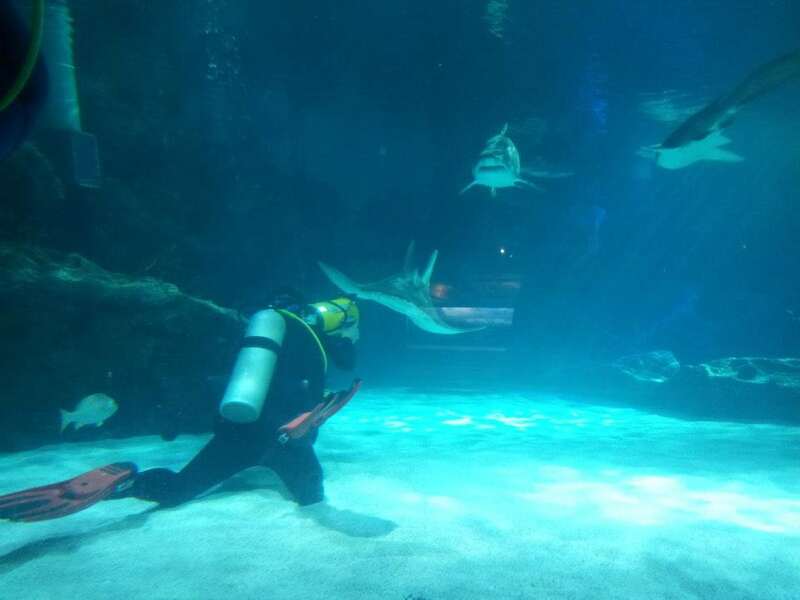 Prepping for a dive with sharks. 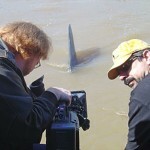 Dave Theis filming shark rays. 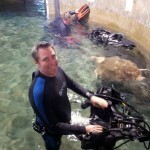 Dave Theis getting eye-to-eye with a shark ray. 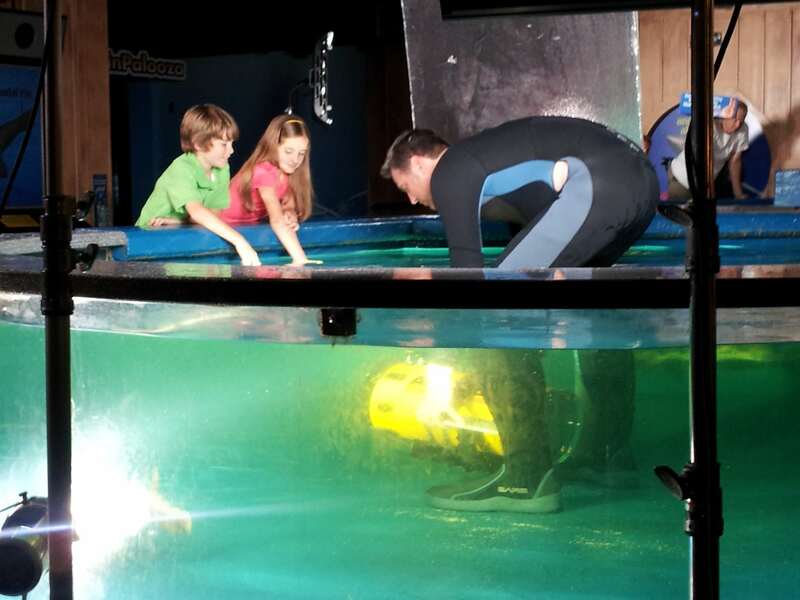 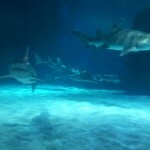 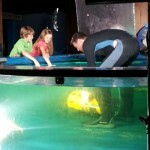 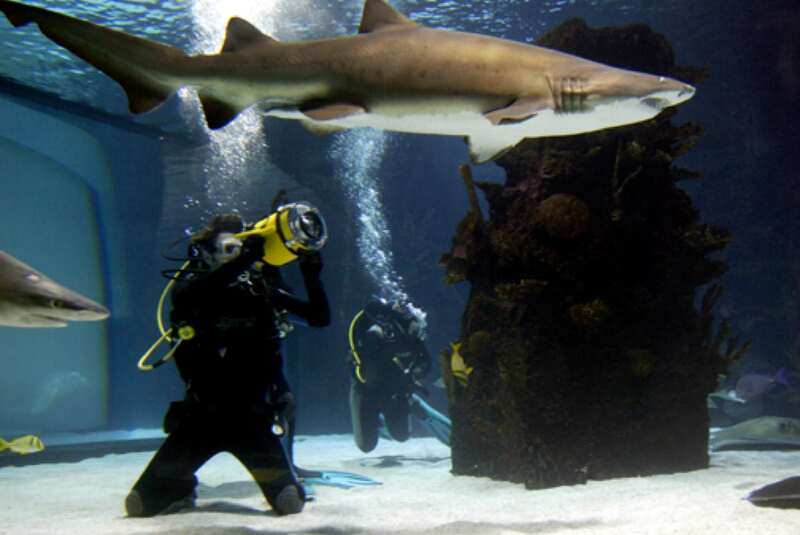 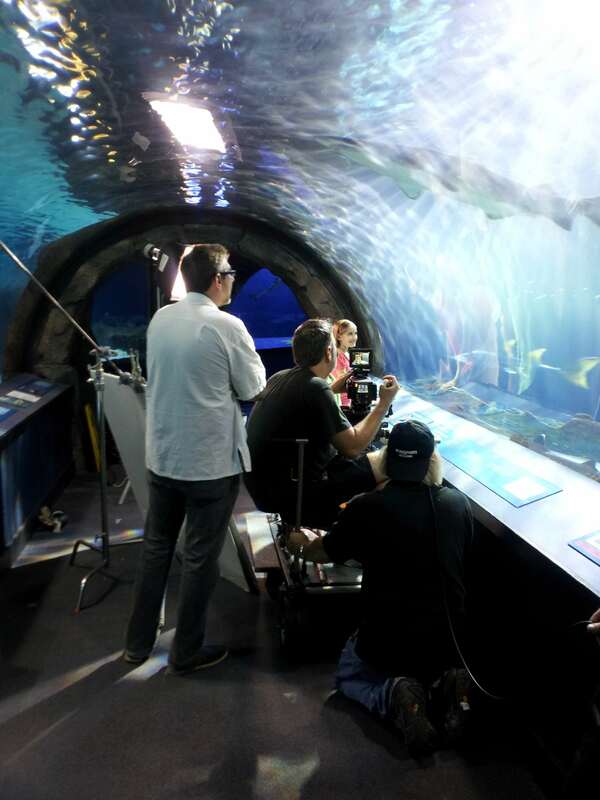 Filming shark petting from underwater. 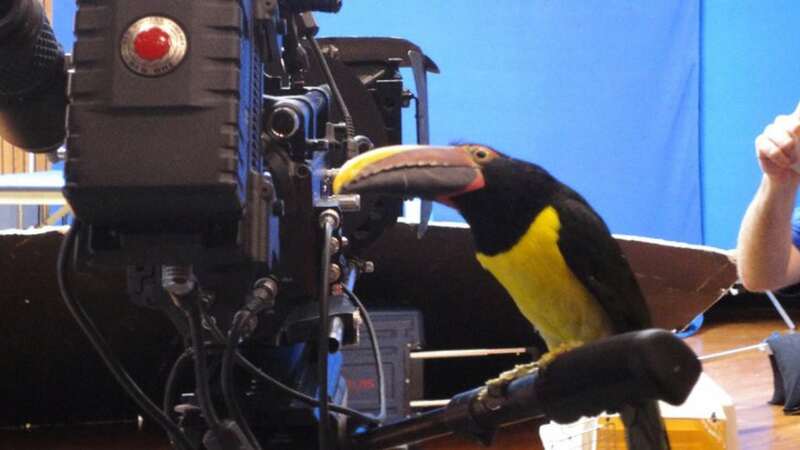 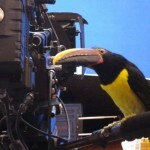 The Aracari Director of Photography. 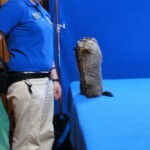 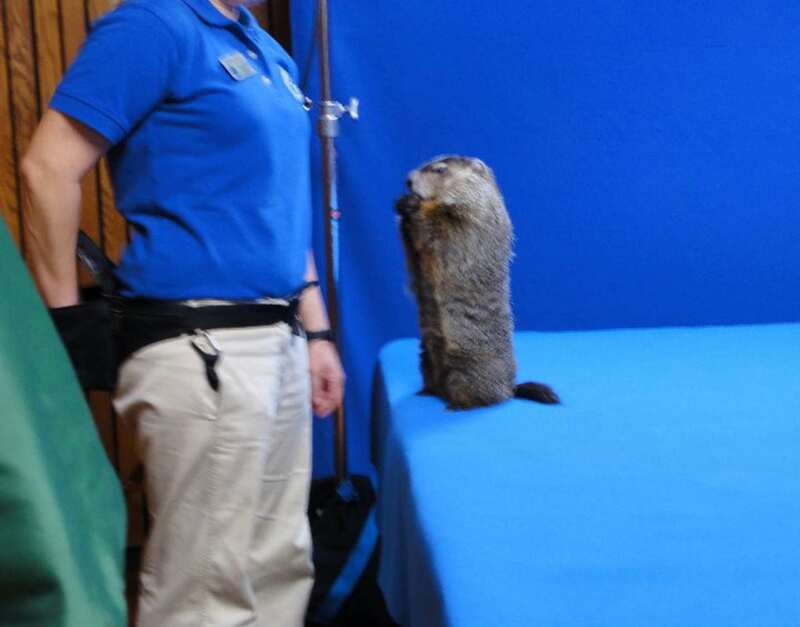 Chattanooga Chuck’s Ground Hog Day predictions out-score Punxsutawney Phil’s. 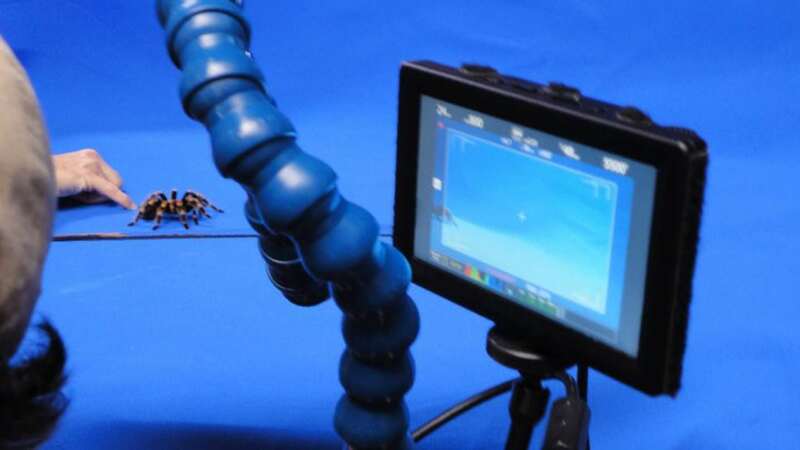 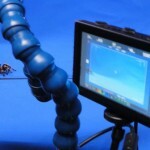 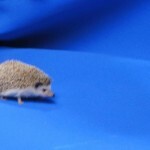 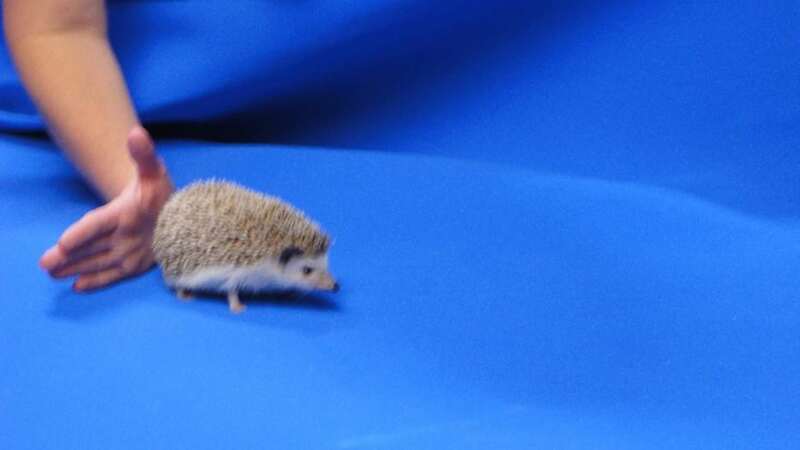 Tarantula struts in straight line on cue. 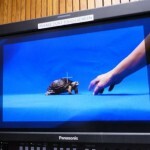 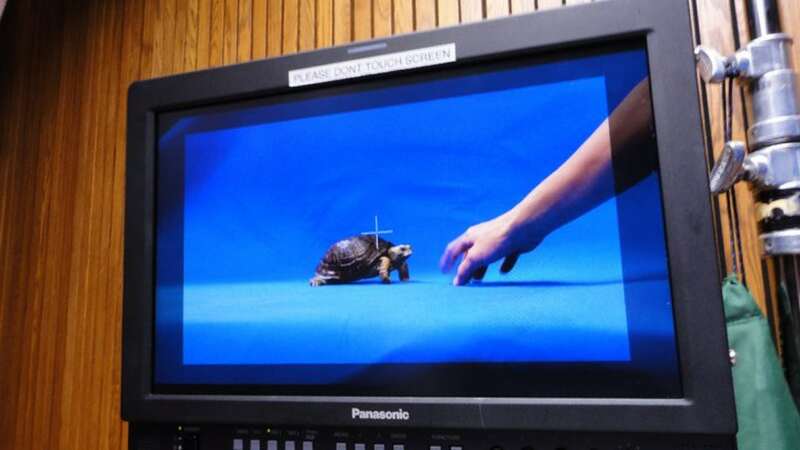 Box turtle hits his mark. 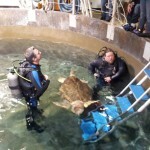 Denver the sea turtle. 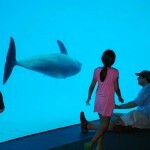 Newport Aquarium’s king-of-the-tank. 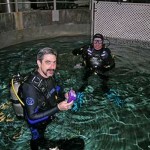 Newport Aquarium’s Ric Urban and “mini-mike” the gator. 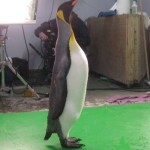 Ciara Bravo from Nickelodeon’s “Big Time Rush” with Paula the Penguin. 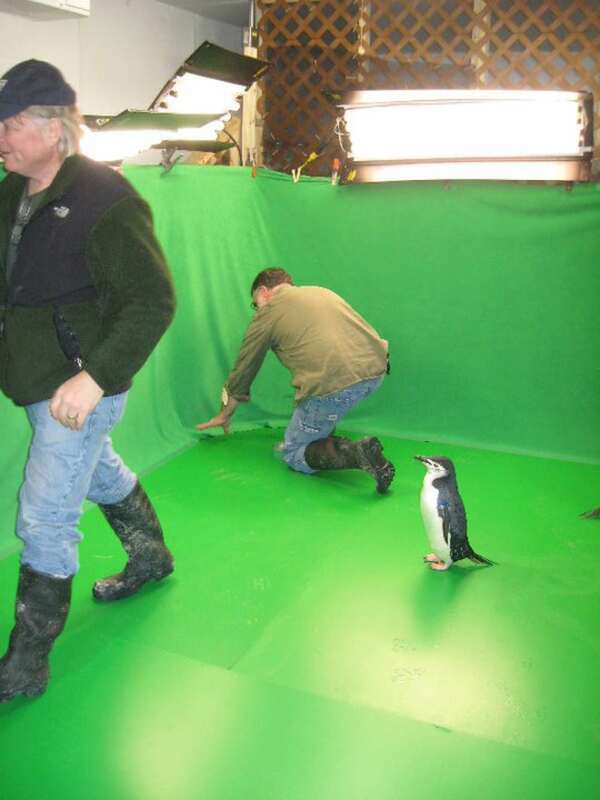 Chinstrap penguin poses on green screen. 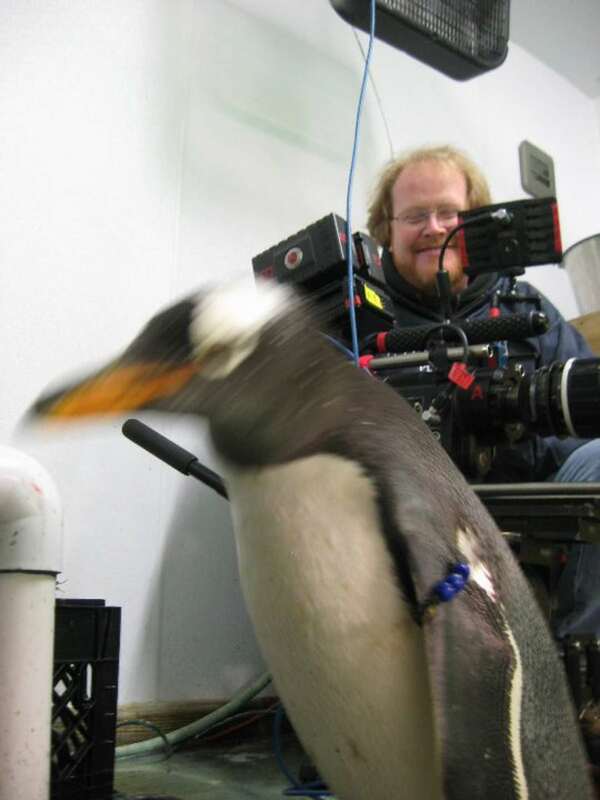 Jeff Barklage gets action shot of gentoo penguin. 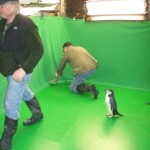 Stand in” penguins for CGI composition. 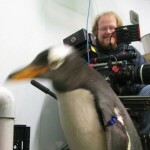 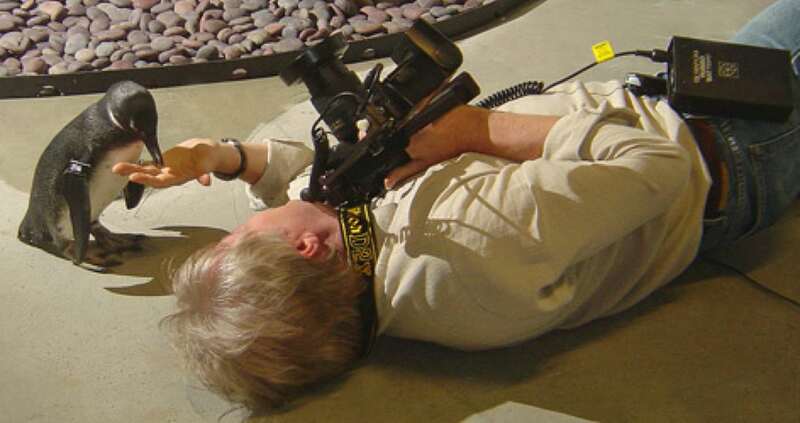 Art Director Dennis Rutherford holds “scaled-to-size” penguins. 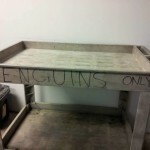 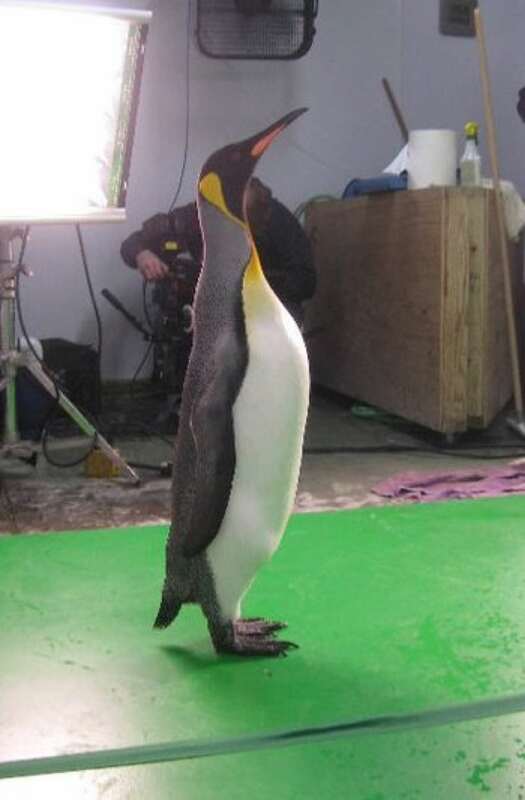 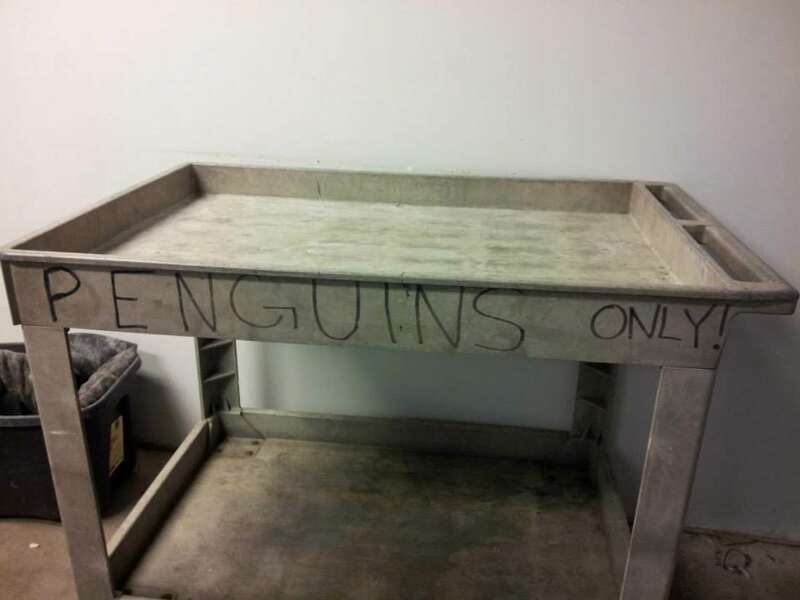 Penguins will get place on the roof with CGI. 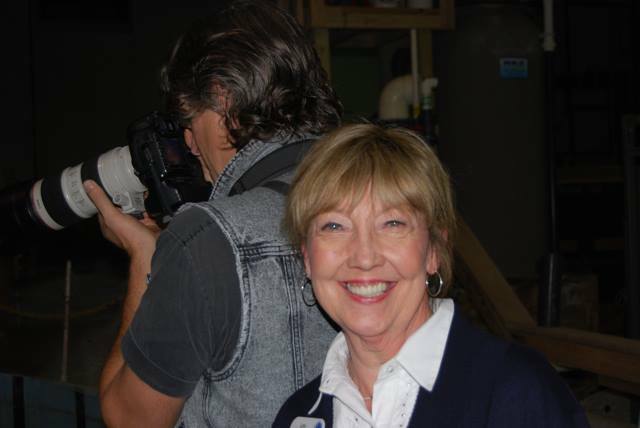 Marketing Director Lynn Margason and her penguin crew. 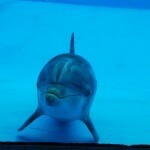 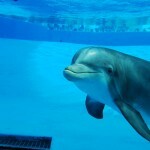 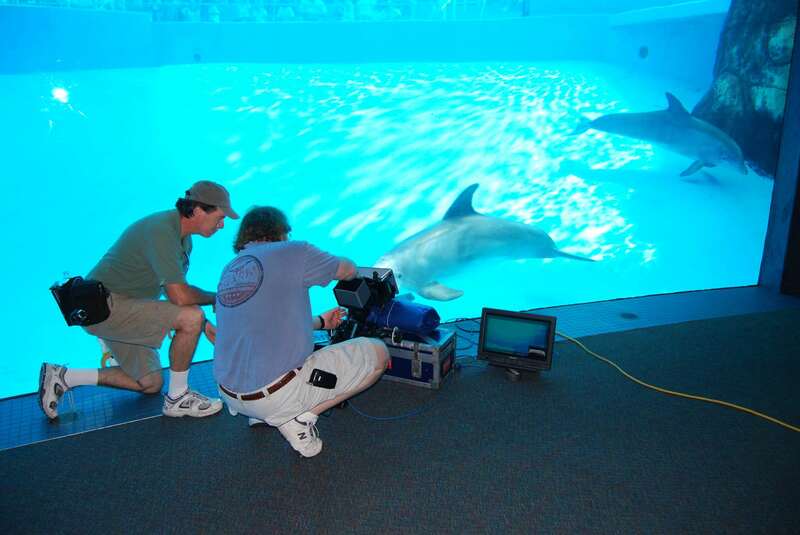 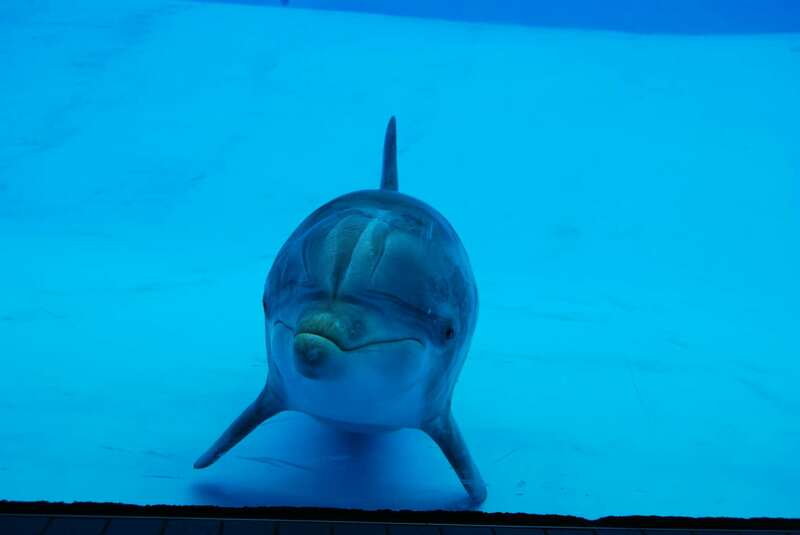 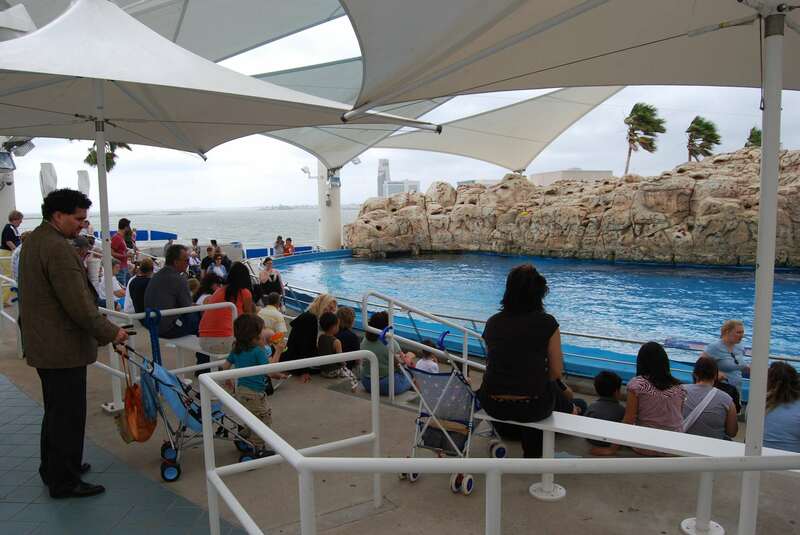 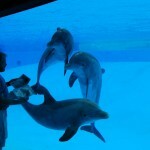 Studying dolphin behavior and patterns. 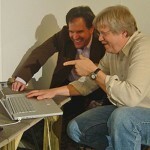 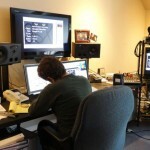 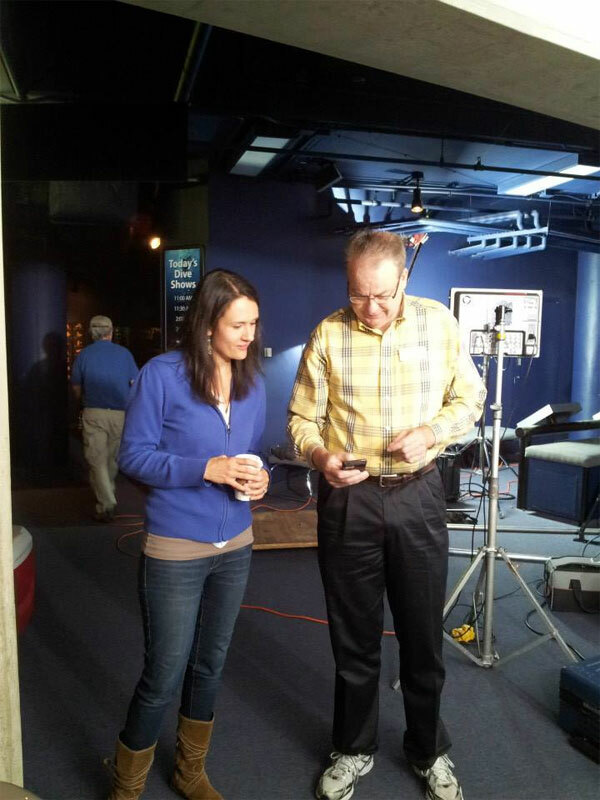 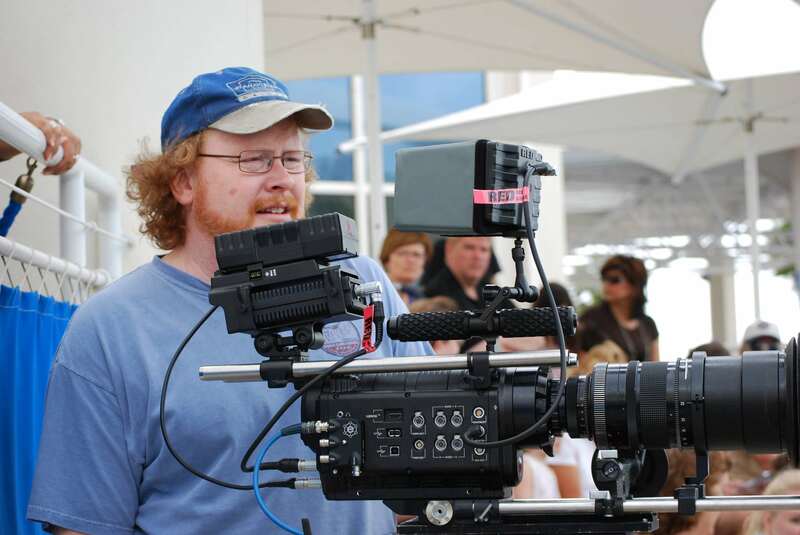 Jeff Barklage shares “shot list” with the talent. 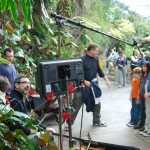 Jeff Barklage shares “shot list” with the talent. 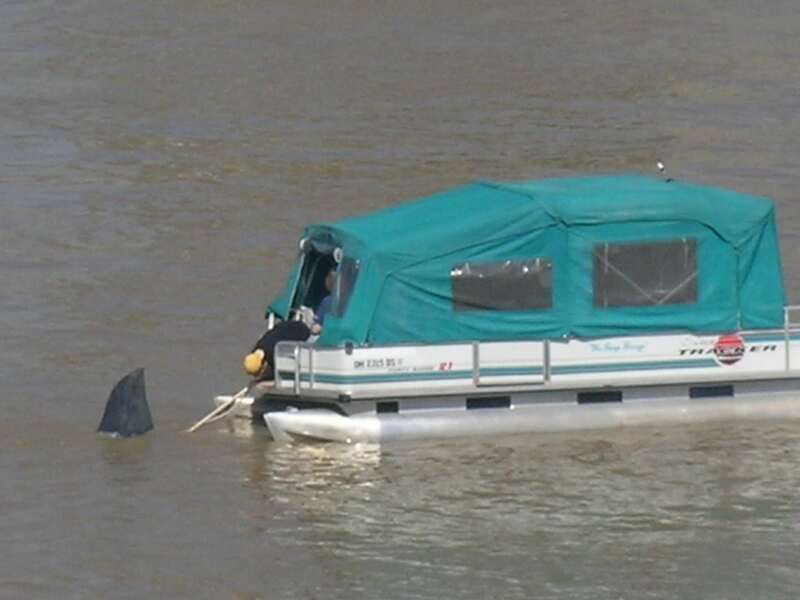 Come on in, the water’s fine. 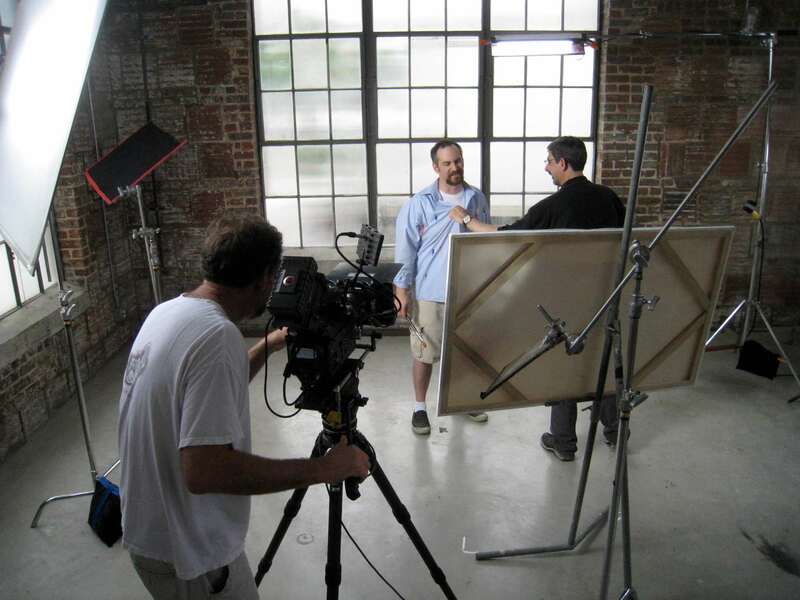 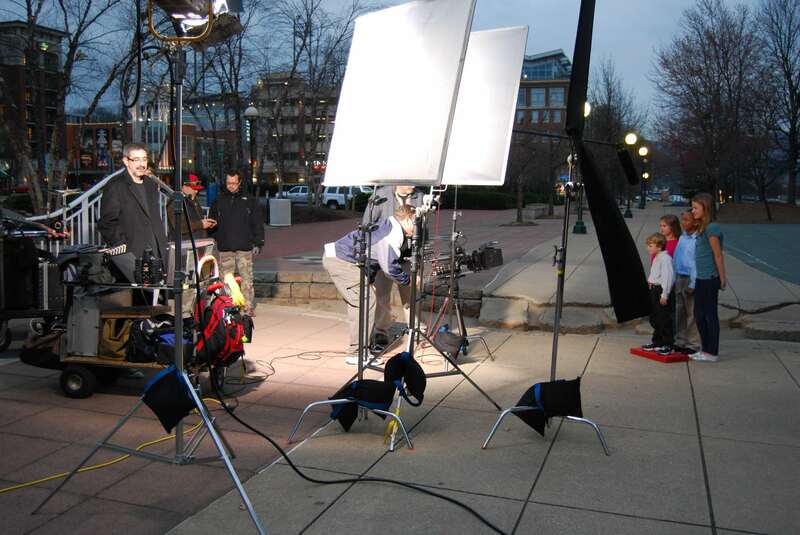 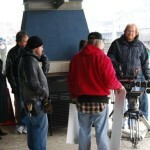 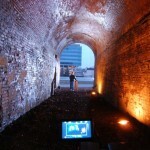 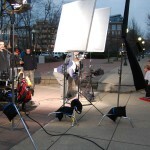 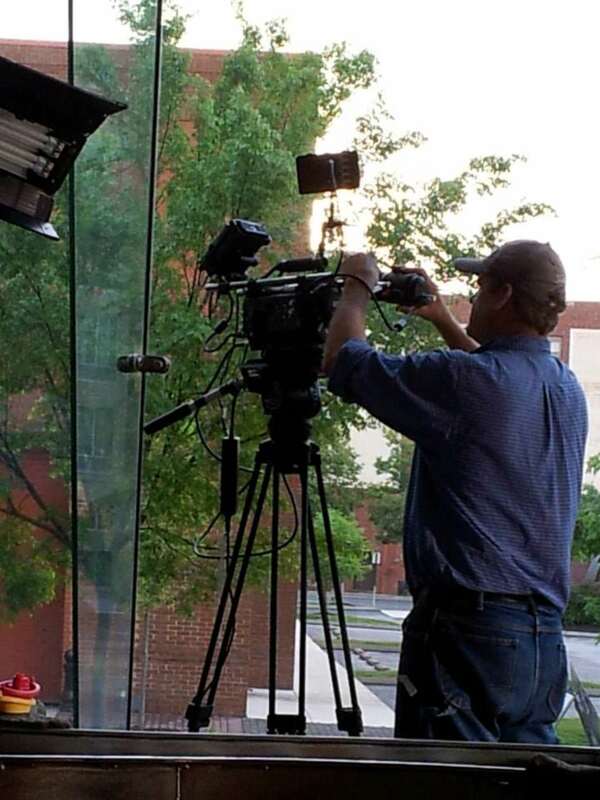 Director of Photography, Jeff Barklage, sets up shot. 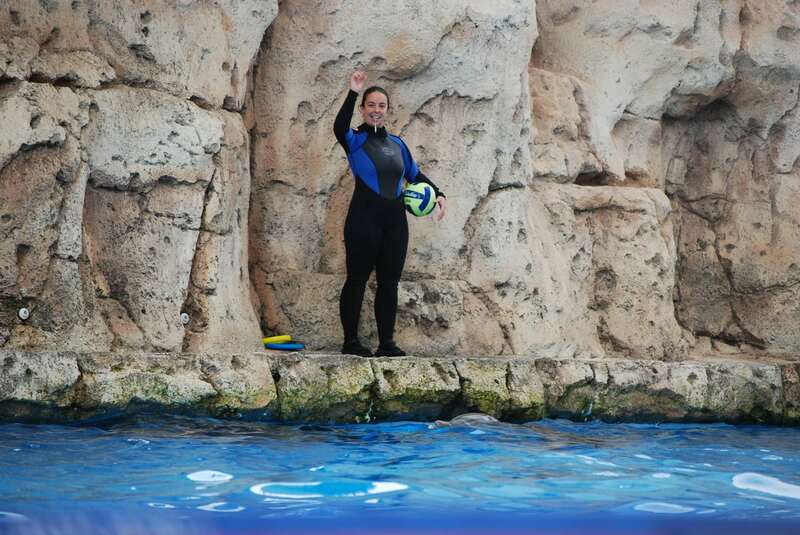 Dolphin trainer ready to roll. 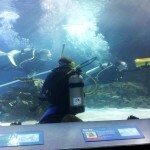 Mermaid Melissa at AZA conference in Phoenix, AZ. 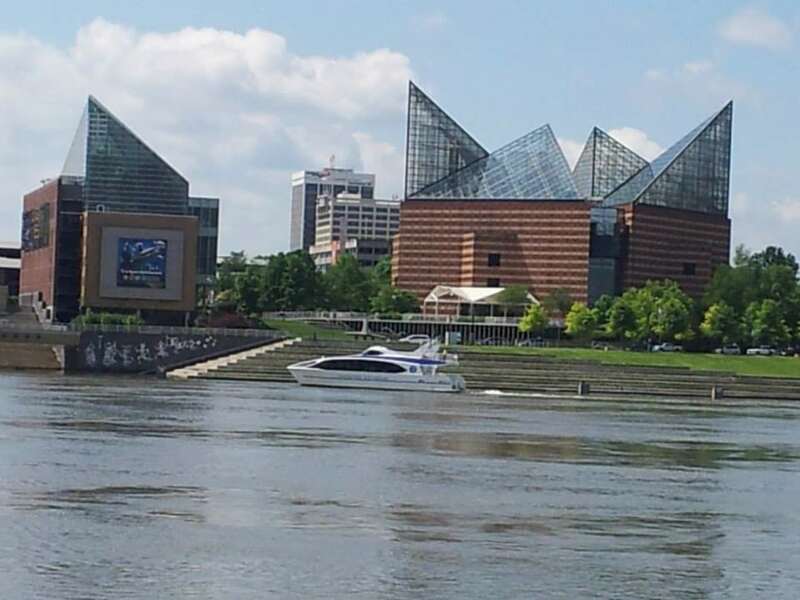 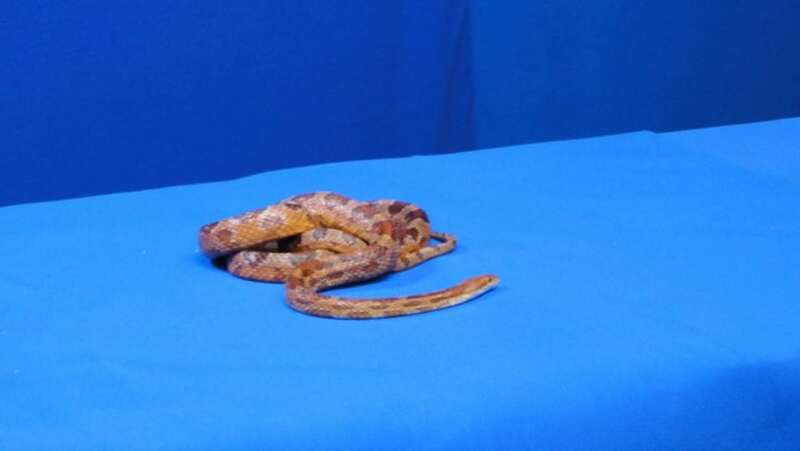 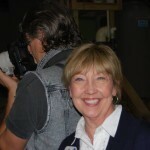 Tennessee Aquarium’s Cindy Todd doubling as a diner. 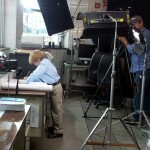 Bobby Stone from Atomic Films. 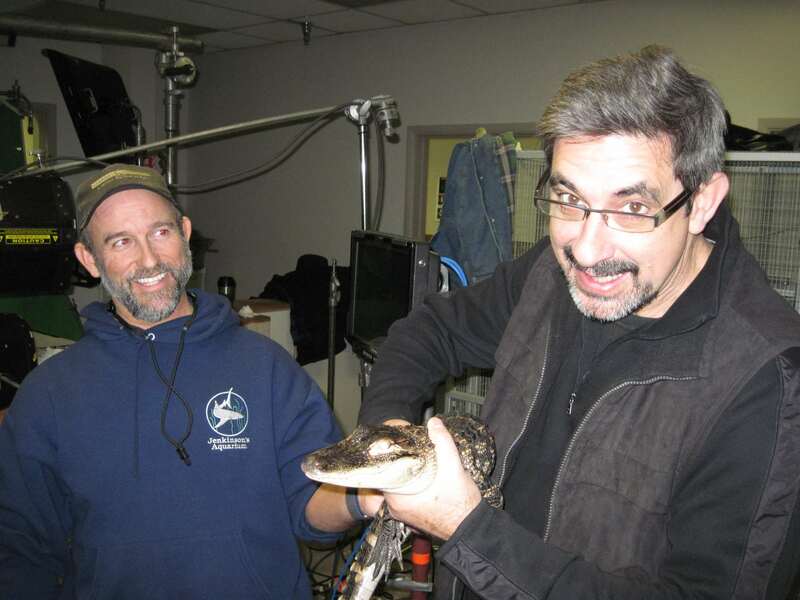 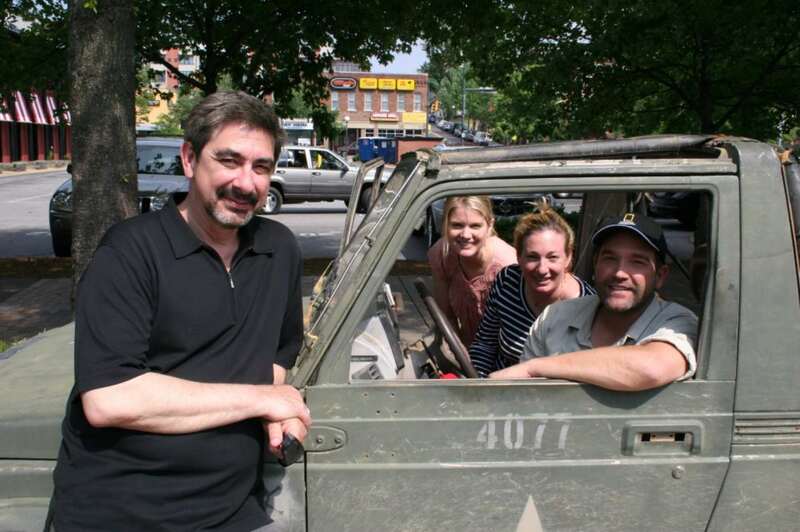 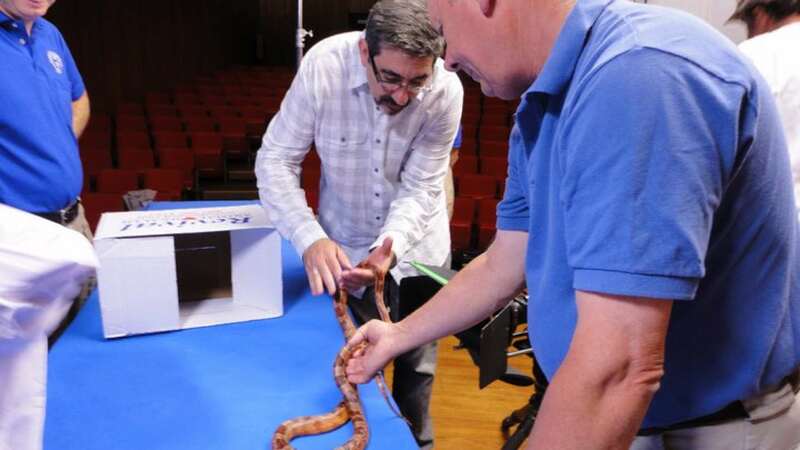 National Geographic “Monster Fish” host Dr. Zeb Hogan with two Nat Geo associates. 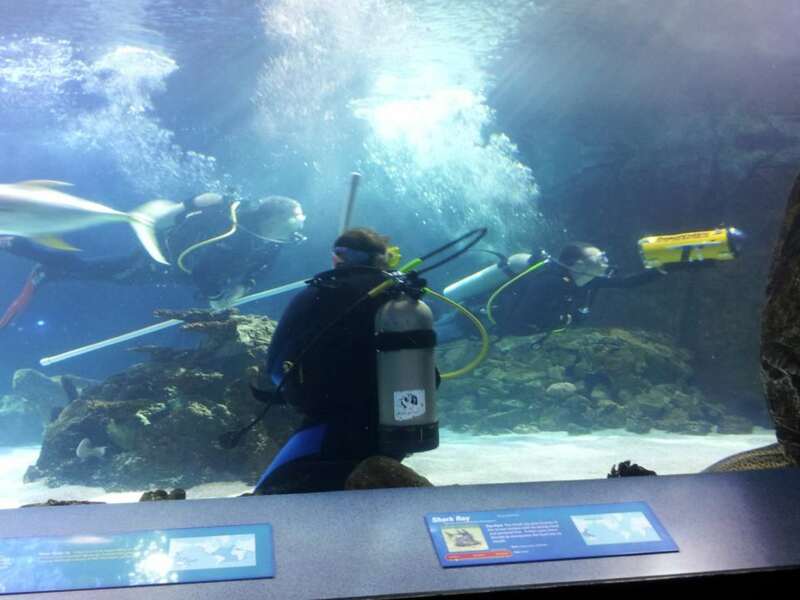 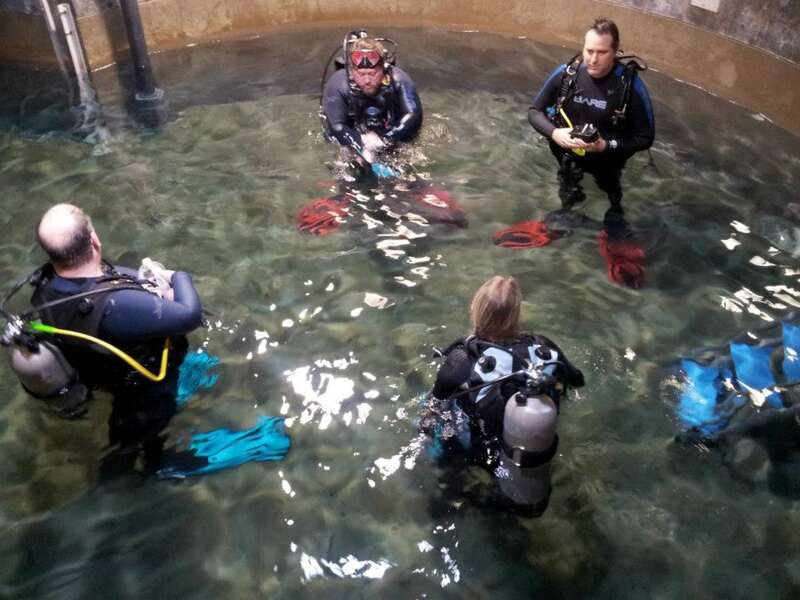 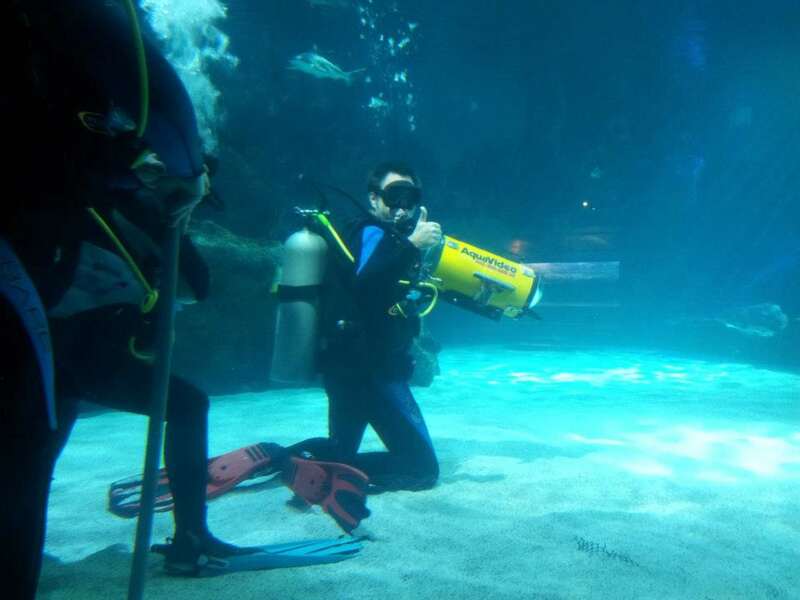 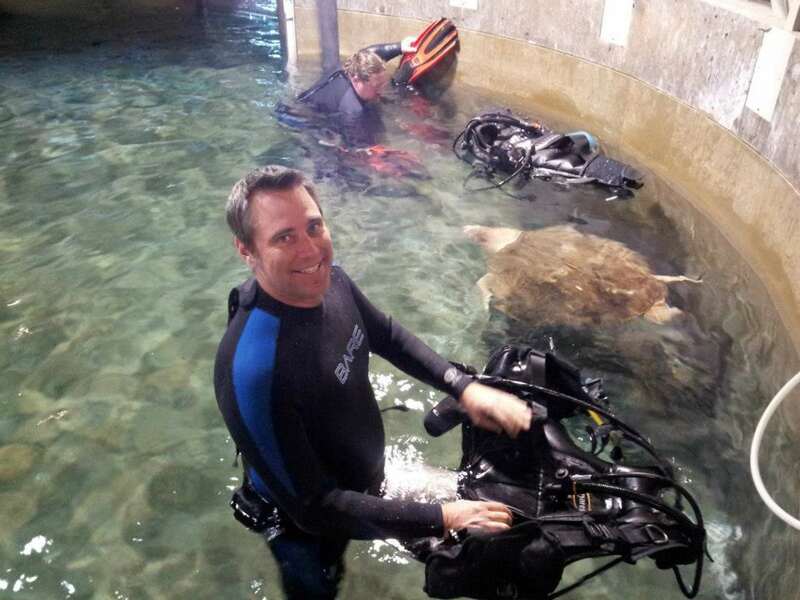 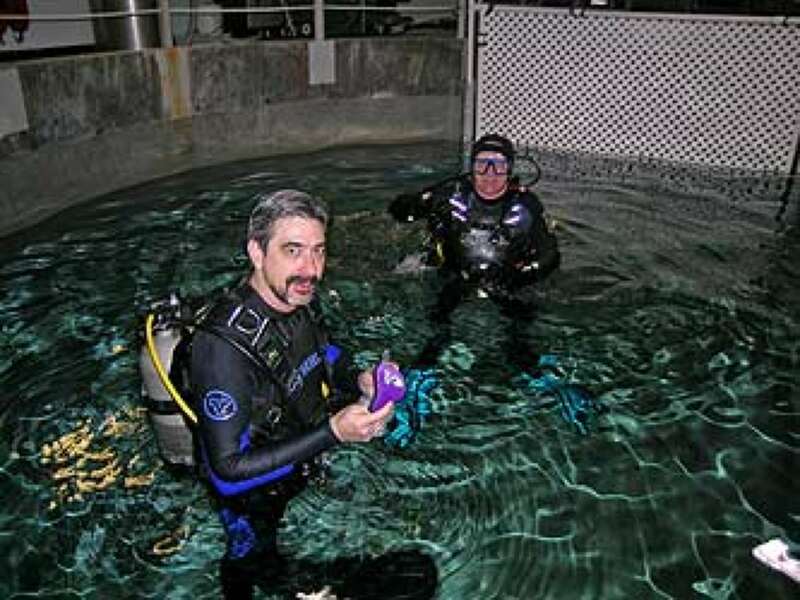 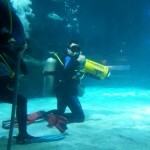 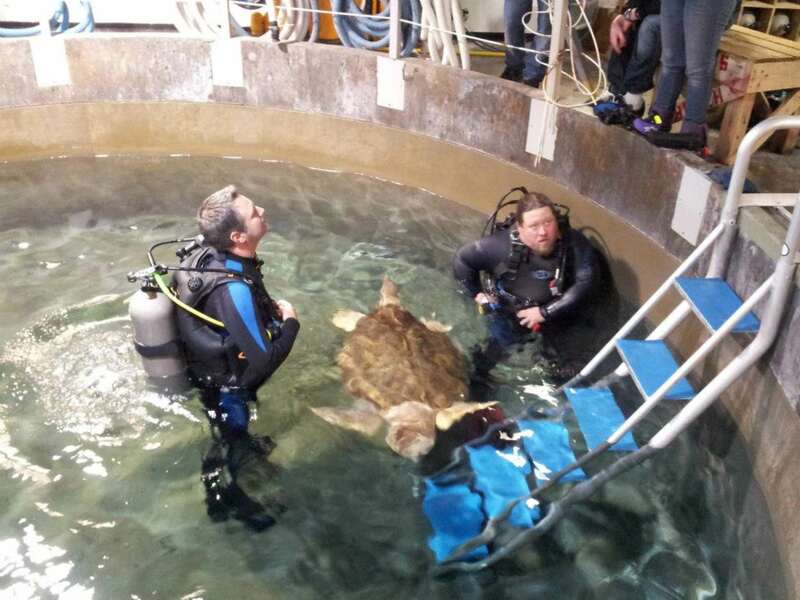 Dave Theis gears up for dive in the holding tank at Newport Aquarium. 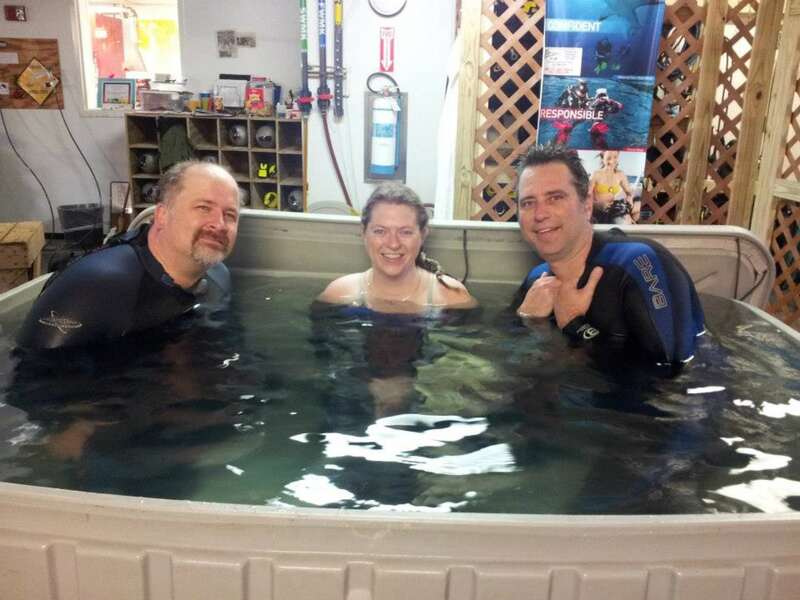 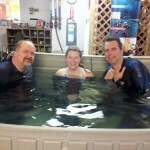 Jen Meeks, Mark Dvornak, Dave Theis and Steve Korb pre-dive safety prep. 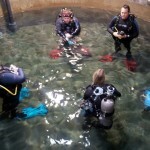 Jen Meeks, Mark Dvornak and Dave Theis warm up between dive 2 & 3. 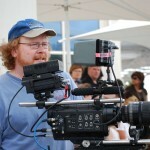 “Big Red” Jeff Barklage, Director of Photography. 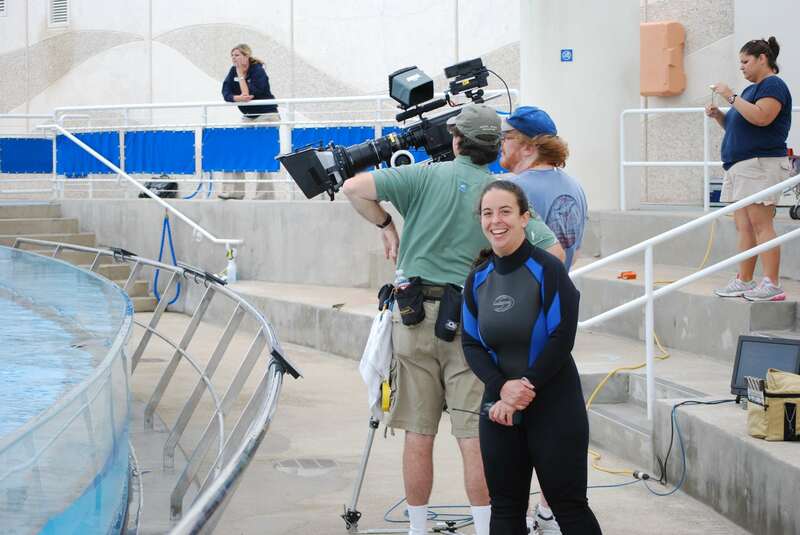 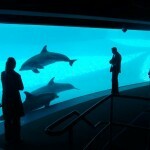 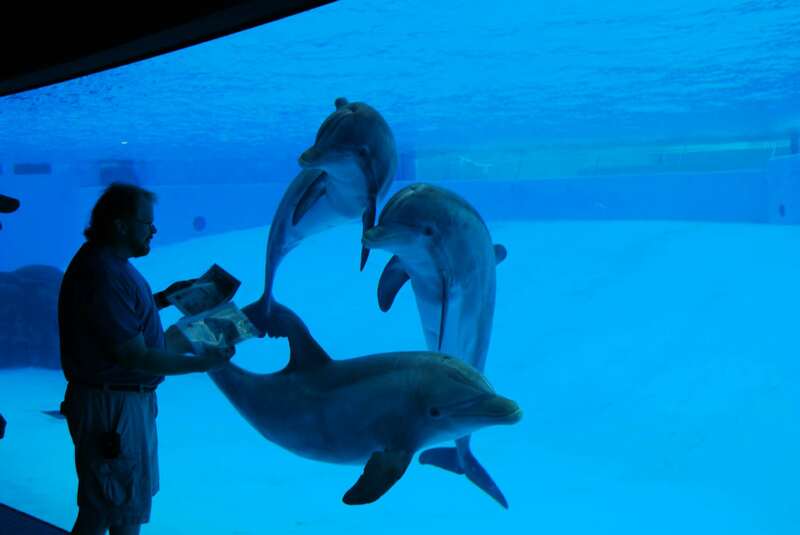 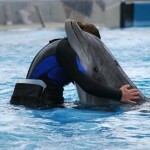 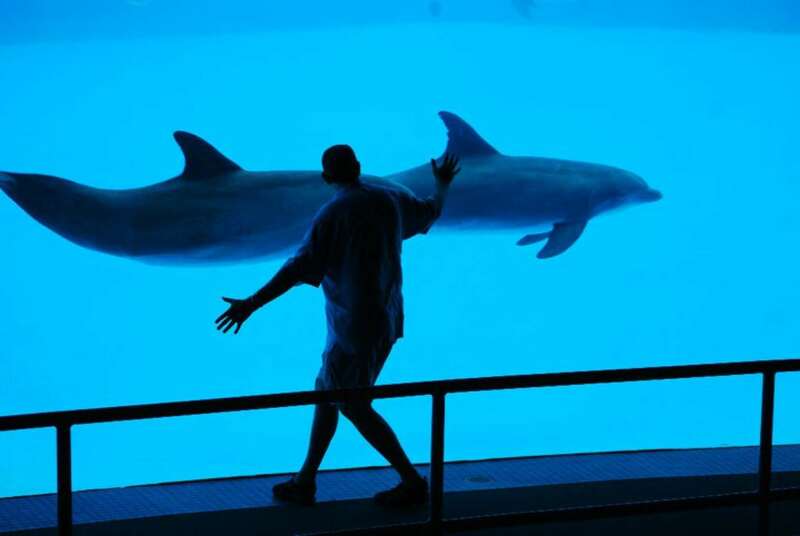 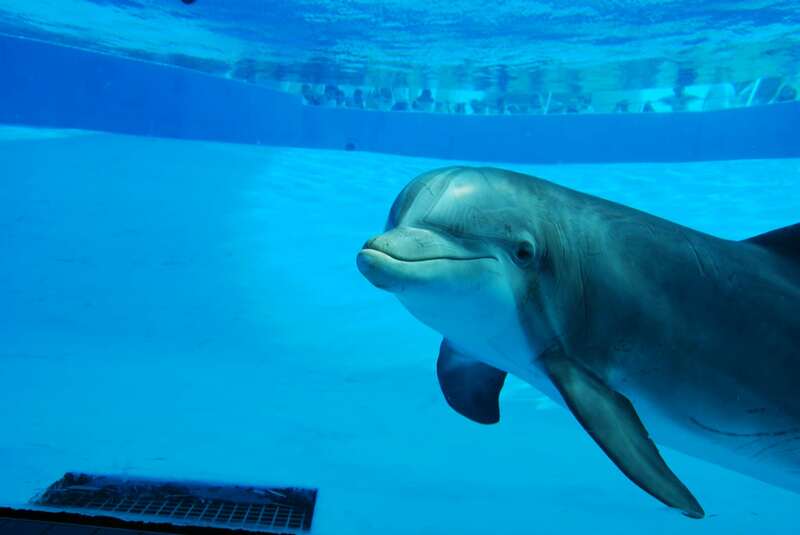 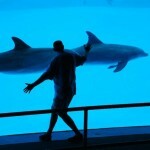 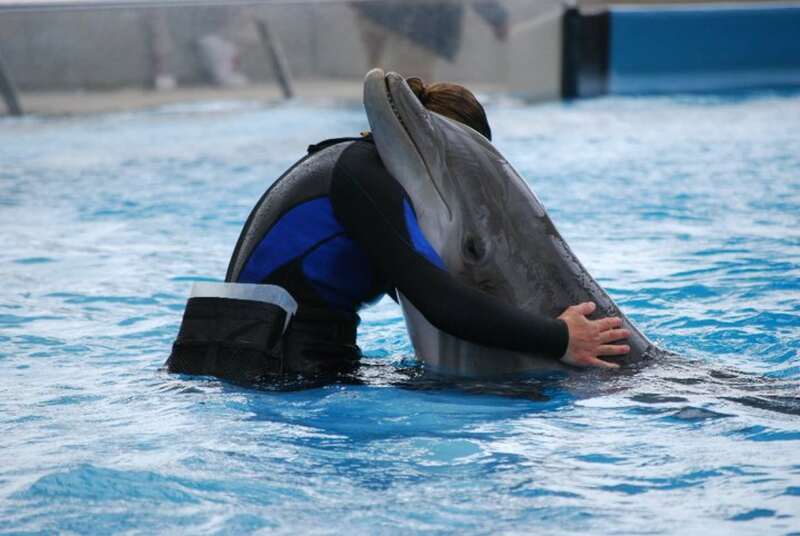 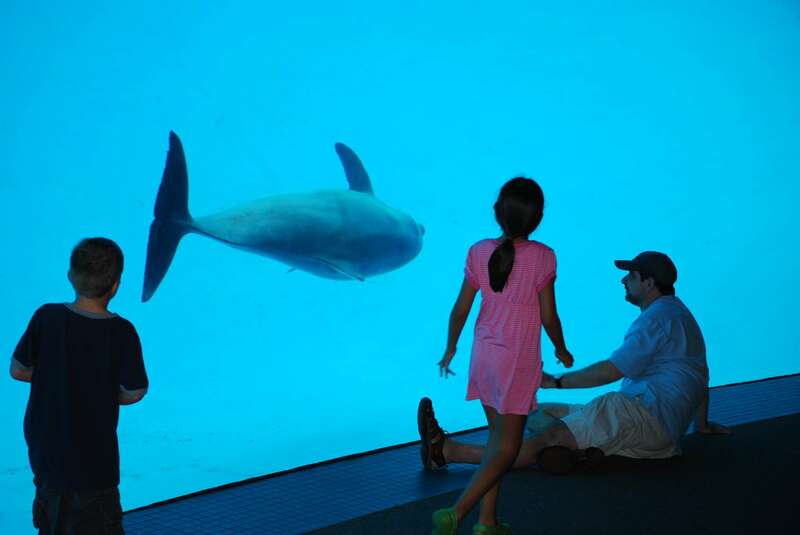 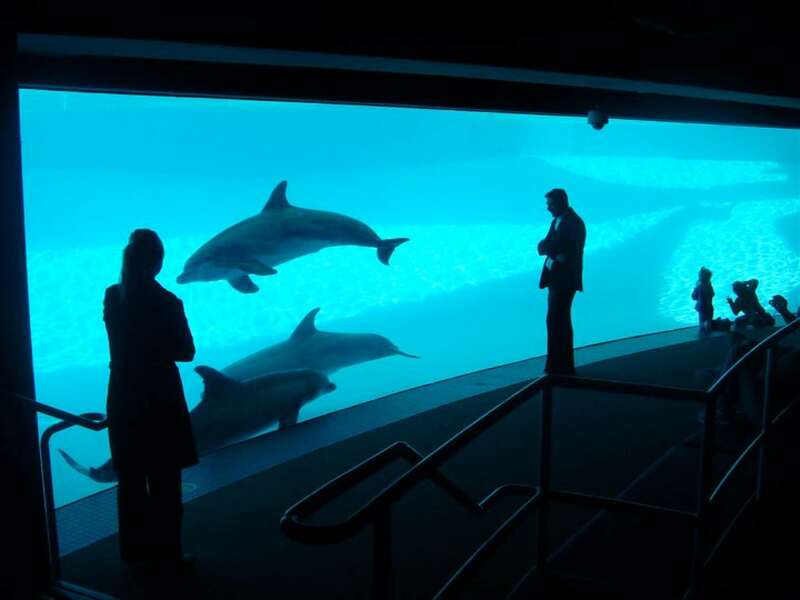 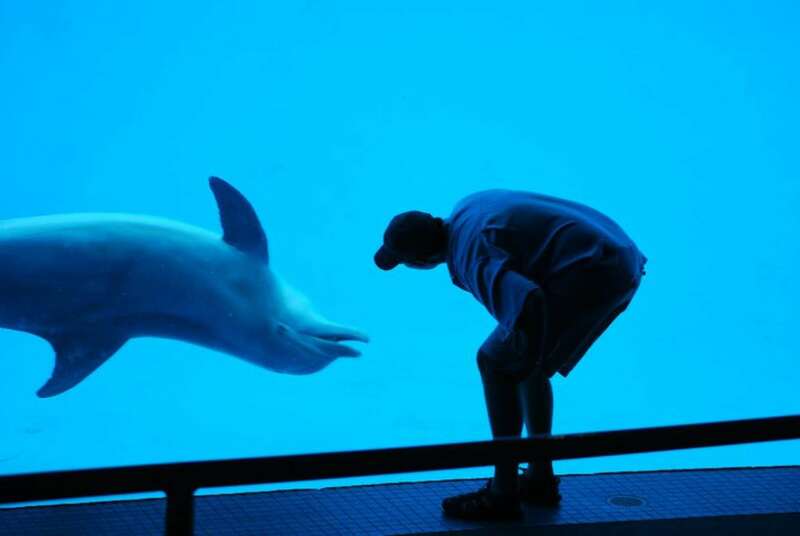 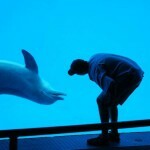 Texas State Aquarium’s dolphin trainer. 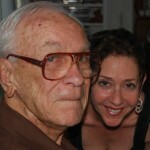 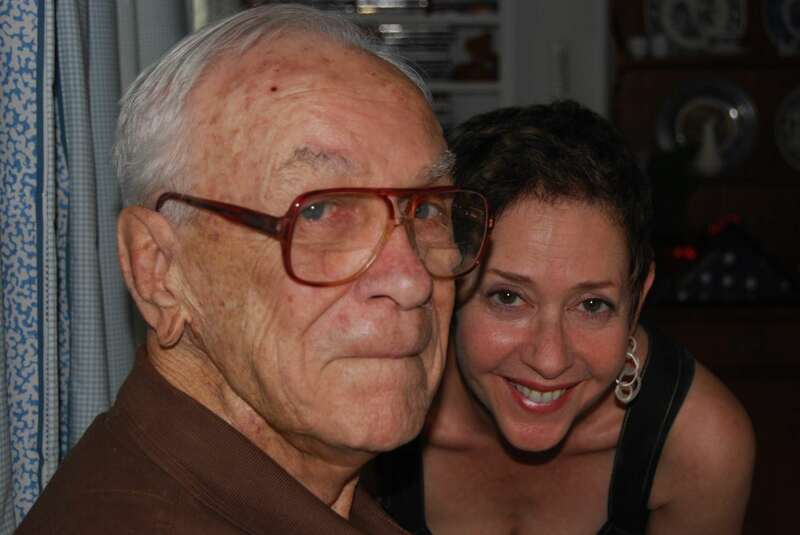 Lowell Newberry’s 90th birthday with Andi. 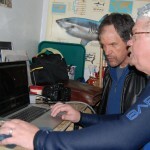 Dennis Rutherford with Photographer Mark Alexander. 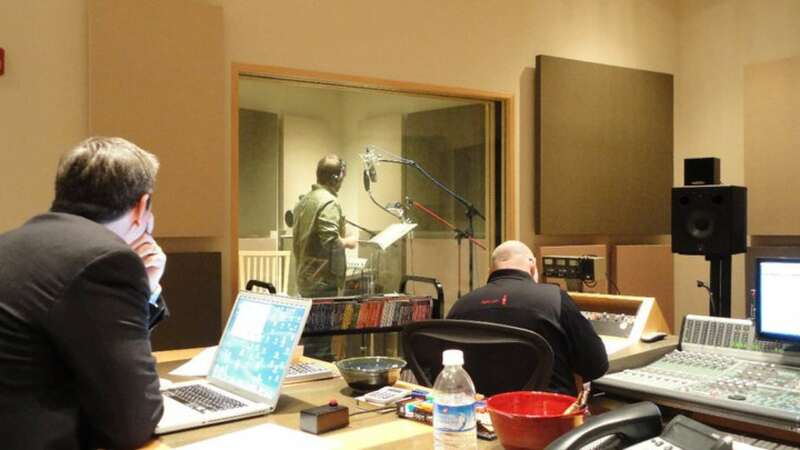 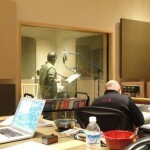 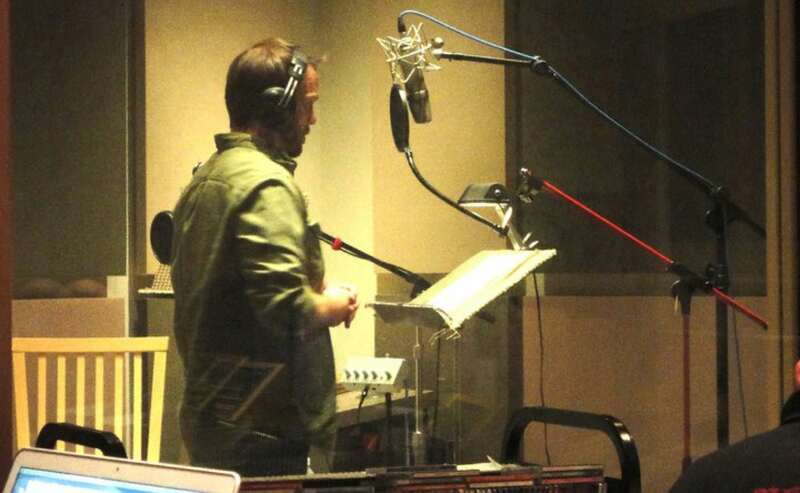 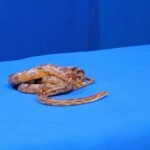 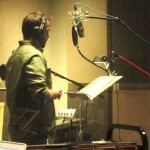 Nathan Neorr voices radio spot for Fota Wildlife Park in Cork, Ireland.